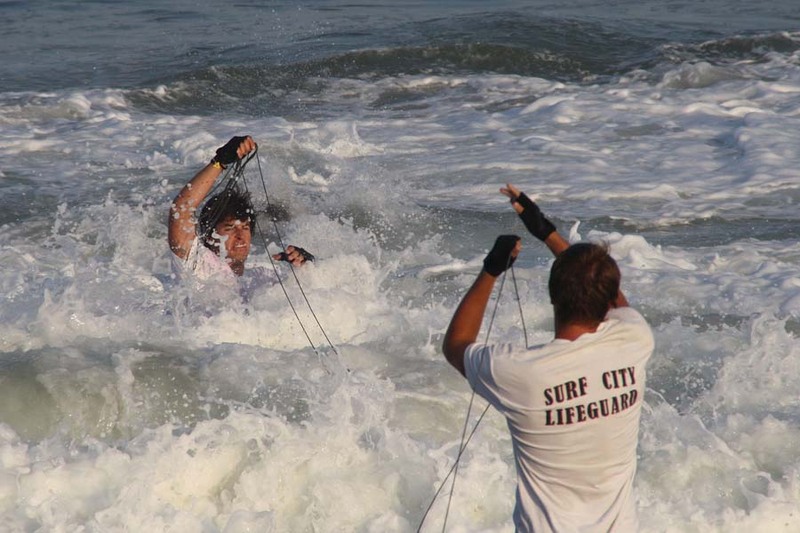 It was another safe summer on the beaches of Surf City thanks to the vigilance and professionalism of the Surf City Lifeguards. 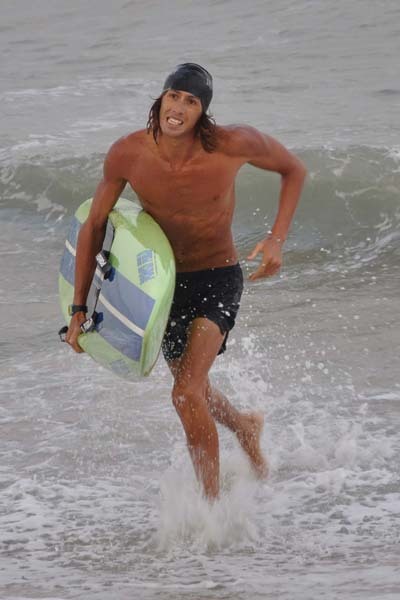 As far as the surf conditions were concerned it was kind of a strange summer with sizeable surf in June and early July. Normally the surf is quite small that time of the year. 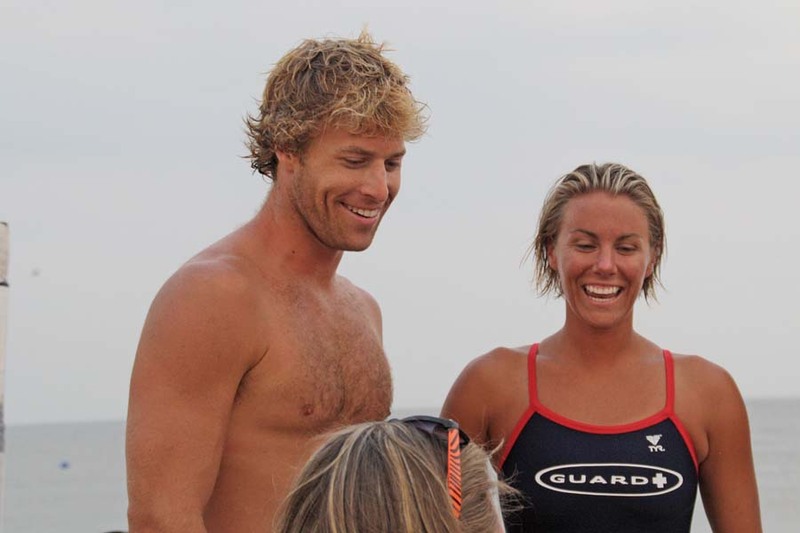 The patrol picked up a few excellent new lifeguards in 2010. 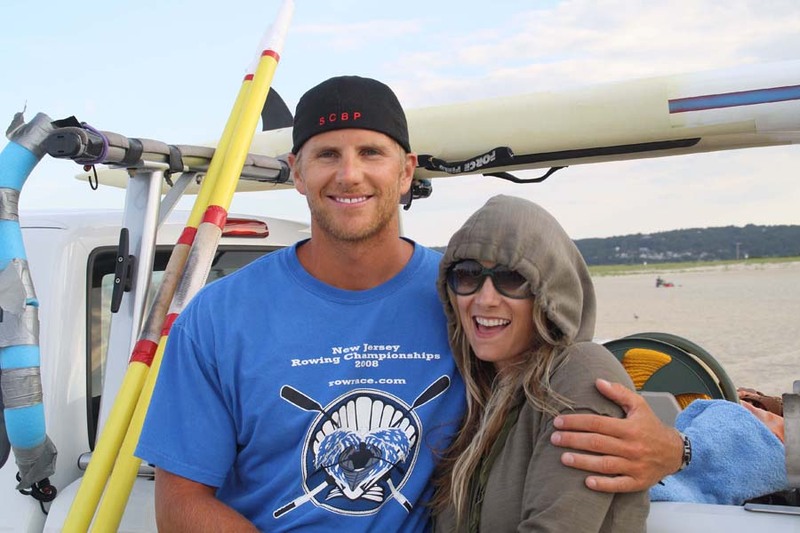 John H, the 5th and final sibling of the H family came on board and even scored a 1st place in the paddle pick-up at Seaside Park with Ryan C. and a 3rd in our Island Tournament. Matt G., younger brother of Mike also joined the Surf City ranks in 2010 and despite being his first year proved to me an extremely competent lifeguard.. LIT phenom Lauren R. was another first year standout doing an outstanding job with the Epic tournament helping the team to a 1st place overall finish along with a very exciting Women's paddle in the Island Tournament and winning beach flags at the Seaside Park Tournament.. It was also nice to have another runner in our morning run club with Lauren attending just about every run. 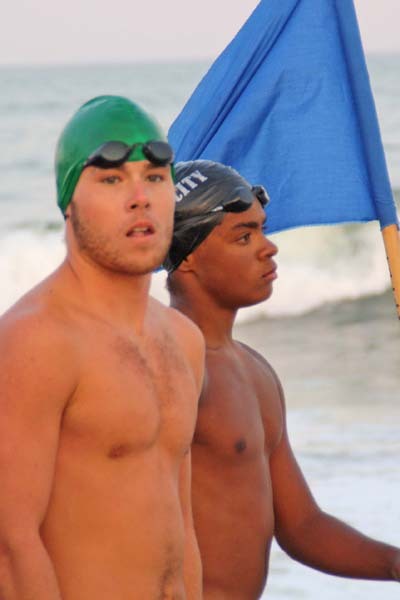 Surf City also welcomed standout swimmers Derek C. and Sean M to the Patrol. 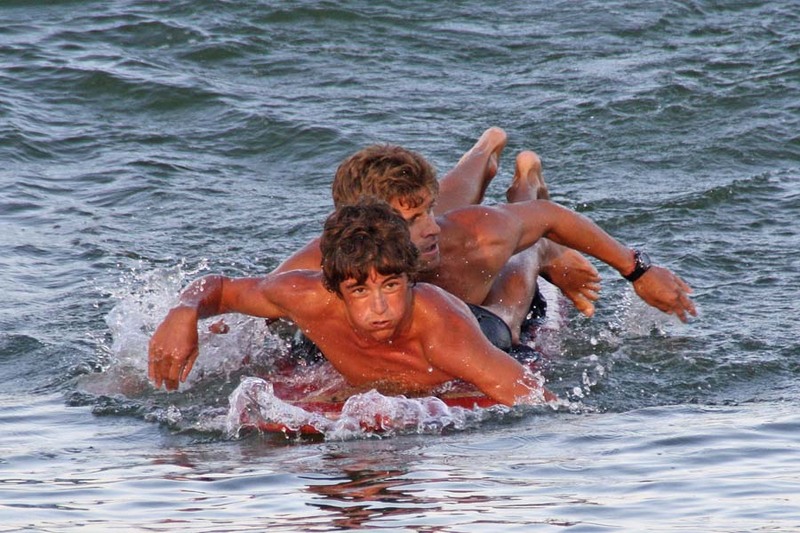 Among other notable swims Derek along with Paul and Harrison pulled out a 3rd place finish in the Island Tournament Surf Dash. 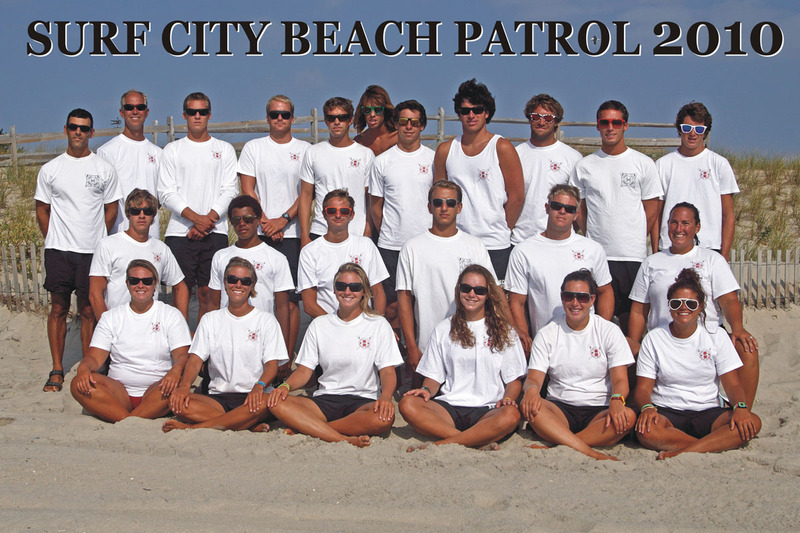 Congratulations to a fine first season to all of the new Surf City guards and I look forward to seeing you and all of the guards in 2011. I would like to make a special mention of Paul's D.' s first aid response on the S2nd beach this season. 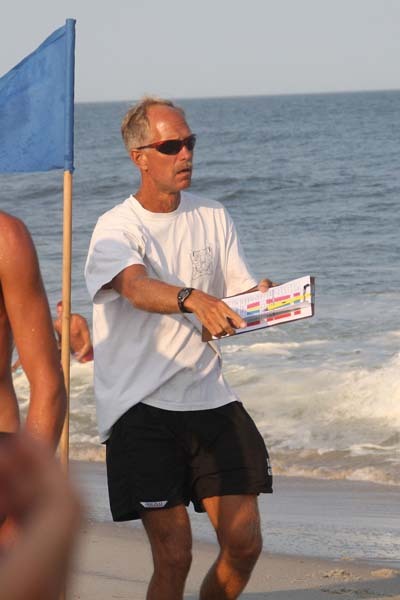 Paul responded instantly to the commotion on his beach an provided CPR to the beach patron until the AED arrived. 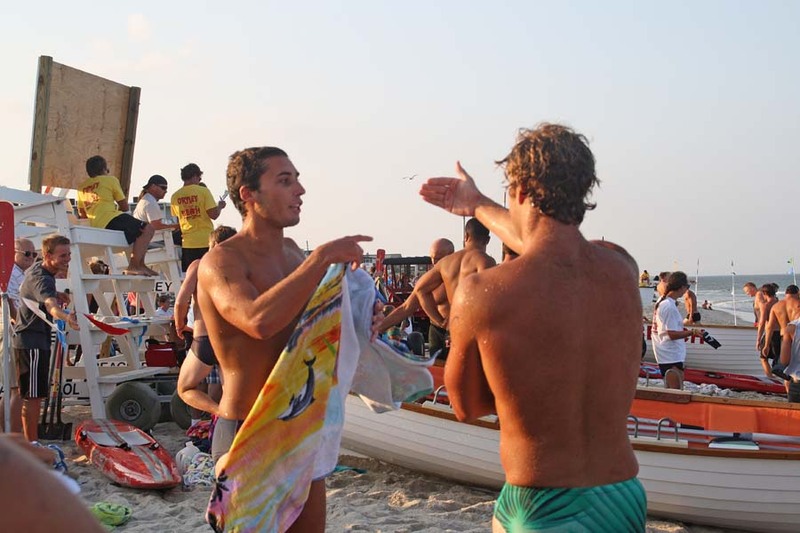 The patron was successfully resuscitated on the beach that day due to Paul's efforts. 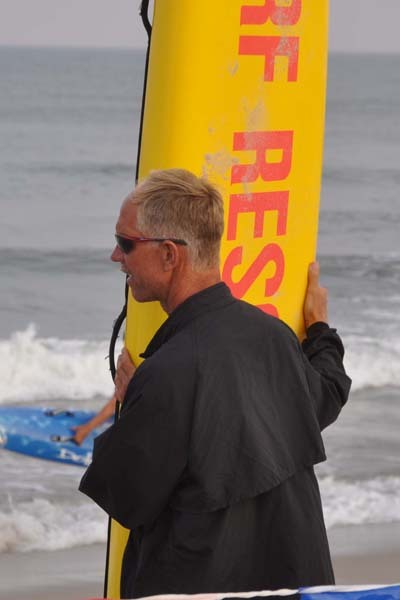 I can't tell you how many S2nd beach patrons came up to me and told me what a fantastic job Paul did and how good they felt to have him as their lifeguard. Paul received a special commendation from the Surf City EMS at our annual banquet for his heroic effort. 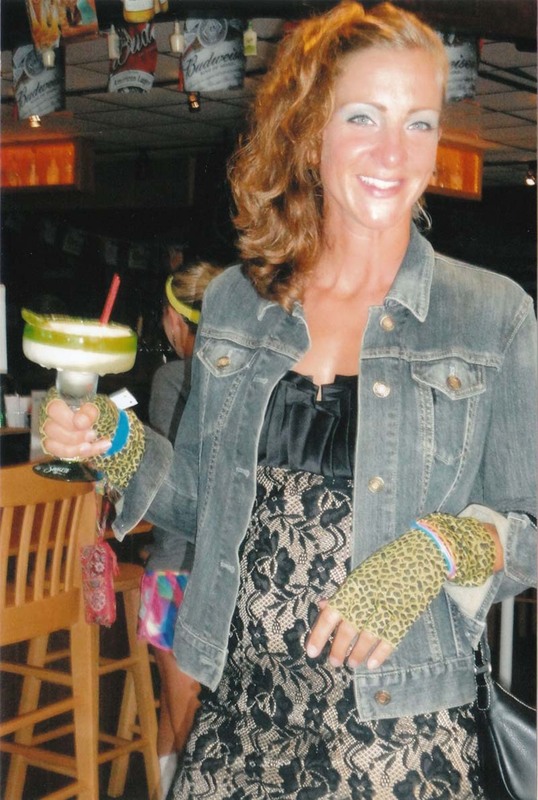 Finally, I want to thank Meredith H. for attending every tournament and taking all of these great photos. For the first time we have photos from every tournament! 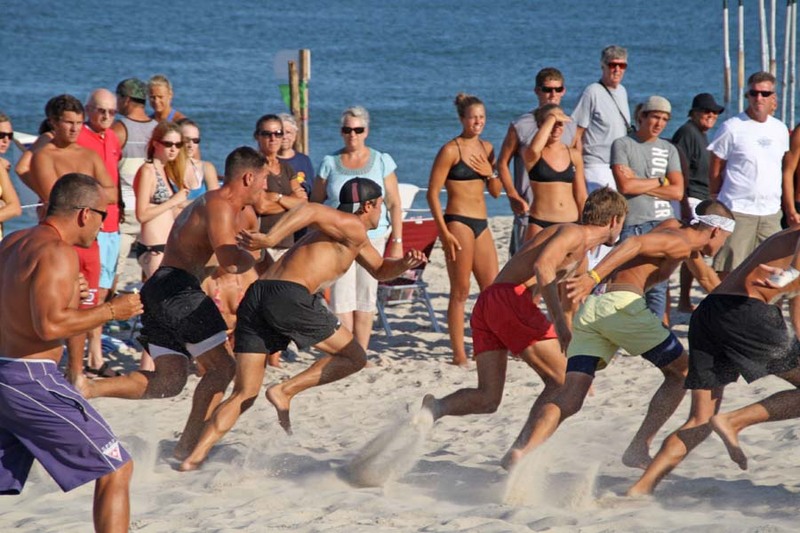 Despite receiving more than our share of injury and sickness this summer the beach patrol had a respectable tournament season winning our Epic Tournament, coming in 2nd (by 2 points) in the Seaside Park Tournament, and 3rd place in the Island Tournament. Surf City 2010 - Most Valuable Tournament Competitor - Jeff H.
Congratulations to Jeff H.! Here are the top 10 scoring competitors. 1st Place Epic Run-Swim - Jeff H. and Alan B. 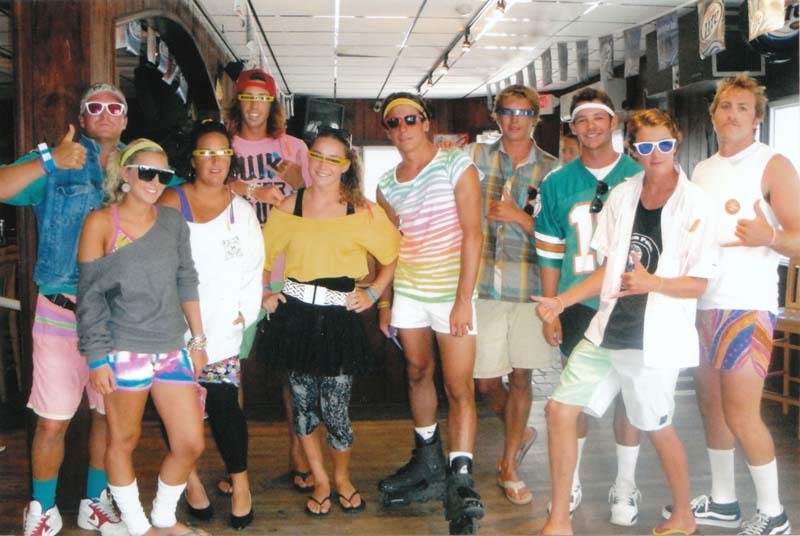 1st Place Run-Paddle - Ryan C./Harrison H./Chris H./Kyle G.
1st Place Swim Relay - Jeff H./Lauren R./Alan B./Ashley M./Harrison H./Chris H./Kyle G./Ryan C.
1st Place Beach Flags - Lauren R.
1st Place 1000' Womens Doubles Row - Jenn W./Collette P.
2nd Place 1000' Open Row - Dave B./Mark D.
3rd Place Open Swim Relay - Harrison H./Andre G./Paul D./Jeff H.
1st Place Paddle Pick-Up - Ryan C./John H.
2nd Place 6 Person Boat Relay - Dave B./Mark D, Matt K./Evan G., Jeff H./Harrison H.
1st Place Run Relay - Kyle G./Jeff H./Harrison H./Dave B. 2nd Place 1000' Doubles Row - Dave B./Mark D.
2nd Place Iron Man - Jeff H.
1st Place Mile Row - Dave B./Mark D.
2nd Place Buoy Rescue - Andre G. and Ashley M.
3rd Place Women's Doubles Row - Jenn W./Collette P.
3rd Place Open Doubles Row - Matt K./Evan G.
2nd Place Open Swim - Jeff H.
3rd Paddle Rescue - Ryan C./John H.
1st Place Singles Row - Dave B. 3rd Place Mixed Doubles Row - Matt K./Collette P.
3rd Place Surf Dash - Derek C./Paul D./Harrison H.
It’s almost expected that the Epic Tournament will be postponed for one reason or another. 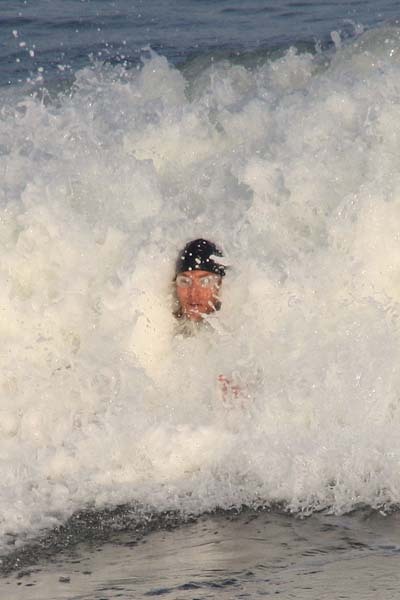 Cold water, rain, large surf, red tide, angry seagulls… pick one. Well maybe not angry seagulls but you know what I mean! This year on the scheduled day of July 13 we had large surf and a high probability of rain so the tournament was moved to July 15. 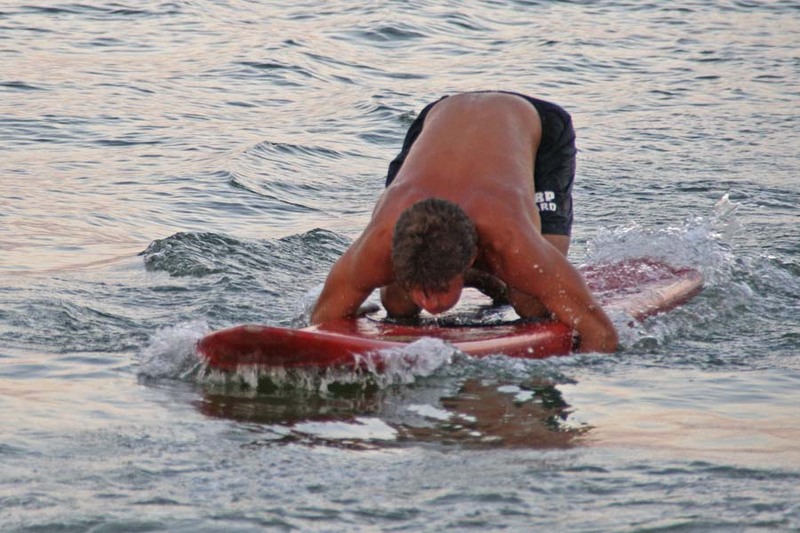 This would also be the first year with a new Run-Paddle event. 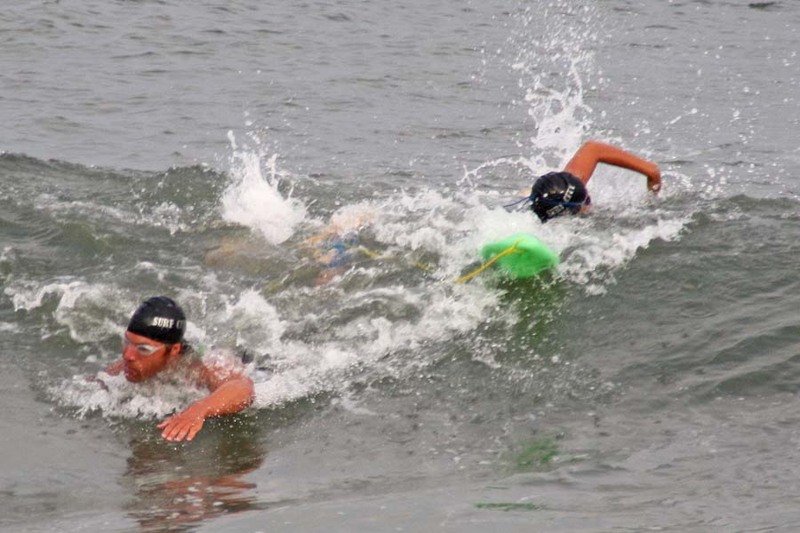 As always the first event in the tournament was the Epic Run-Swim handled by Jeff and Alan. Jeff coming off the mumps (yes you read that correctly, the mumps!) managed a very impressive 3rd place finish while Alan swam his way up to 6th place for a combined place total of 9. 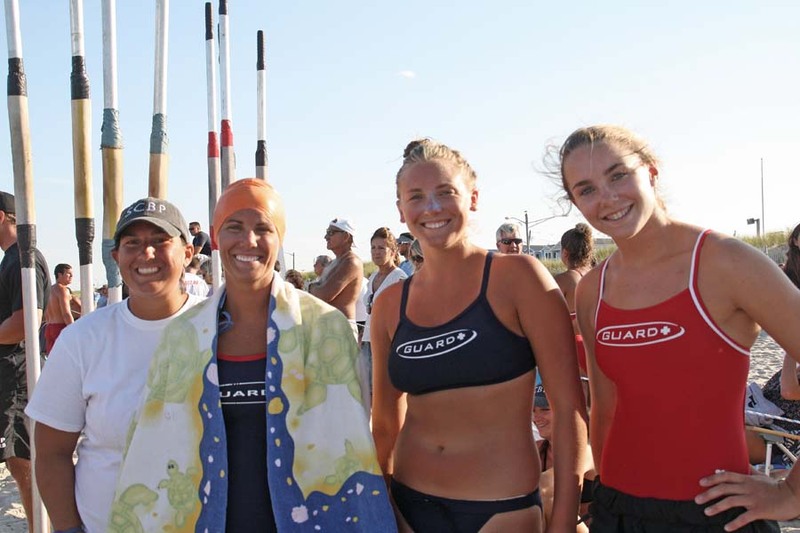 It was a very close win for Surf City in this event with Barnegat Light and Ortley both having 10 team places. The 2nd place team points went to Ortley because on of their competitors won the event. While Jeff and Alan were off in the Epic Run-Swim the other four members of the team would be competing in the Run-Paddle. 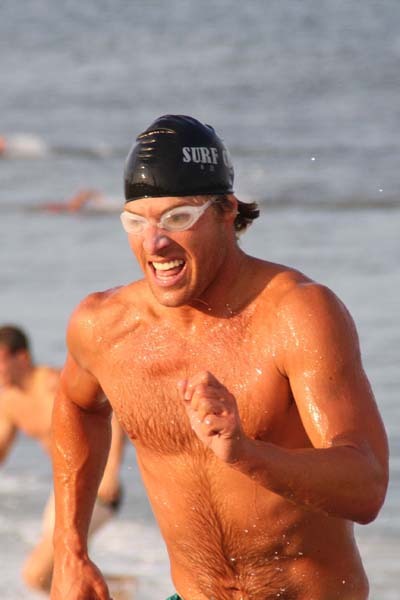 The first competitor in this event, Ryan C. would be completing the same 2 mile run as the Run-Swim competitors and then going right into the paddle portion of the event. Ryan came in 2nd in the run and quickly passed the first runner on the paddle portion of his leg. 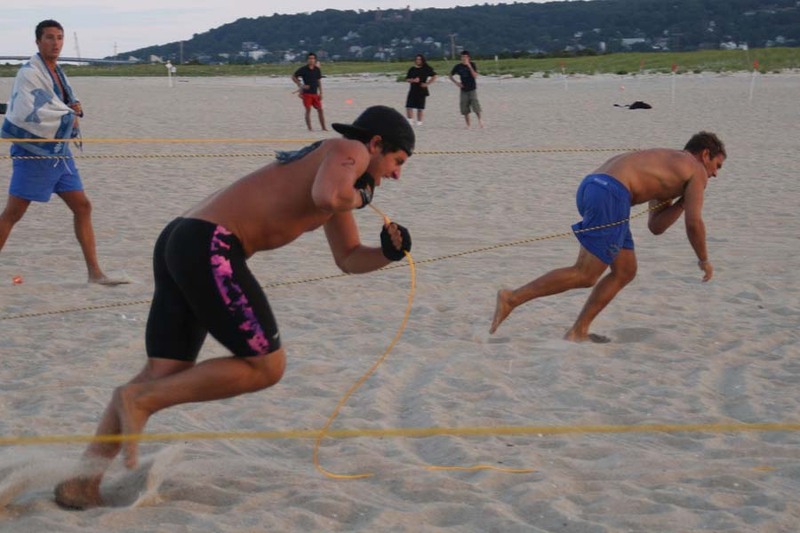 The other competitors in this event were Harrison Hahn, Chris Holloway, and Kyle Gronostajski. 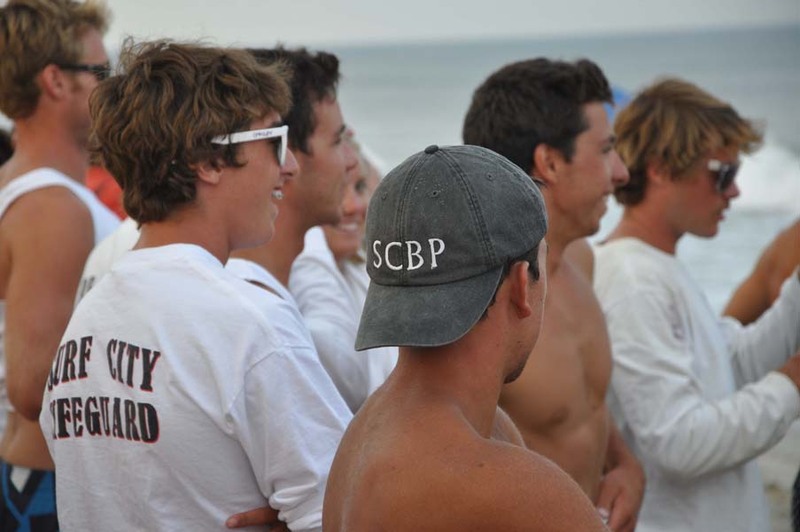 After being handed the lead by Ryan the Surf City paddlers never looked back and came away with a solid first place finish in the second event of the tournament. 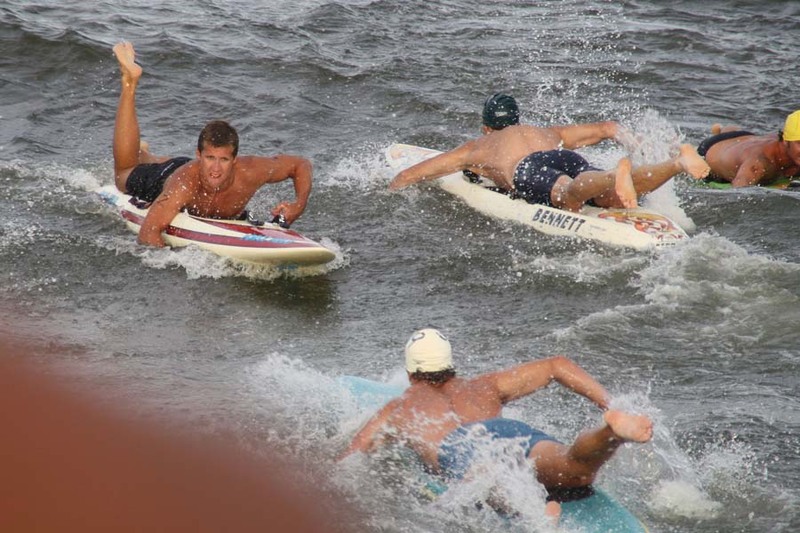 In the next event, the Surf Dash, all six open members of the team would have to compete along with two female team members. 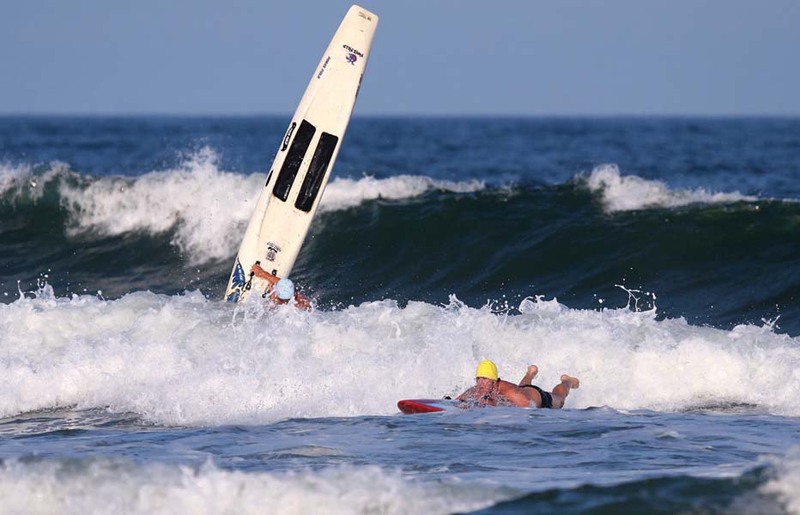 Unfortunately due to the rather large surf the waves were starting to break on the surf dash buoys so they had to be relocated just before the tournament started. 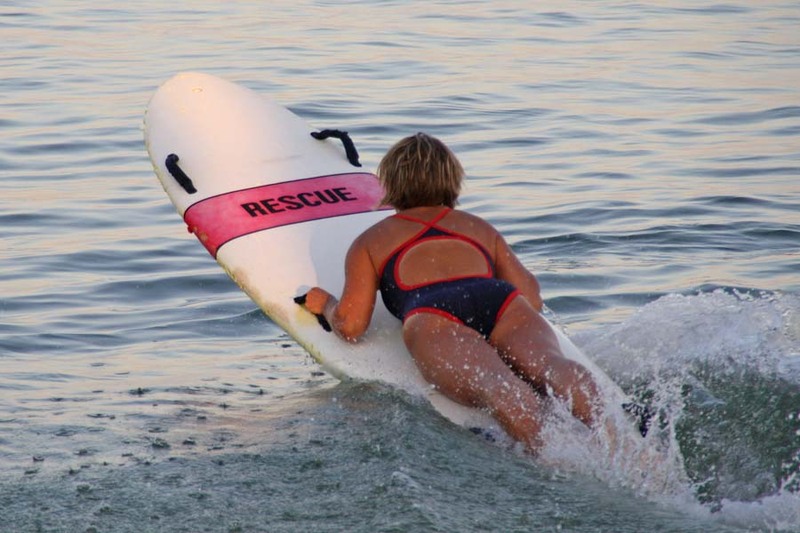 At the same time there was a 5:15PM rescue on this beach and in the confusion the surf dash buoys were set a little farther out and farther apart than the should have been. This meant that instead of taking 15 or 20 minutes the surf dash event took an hour! 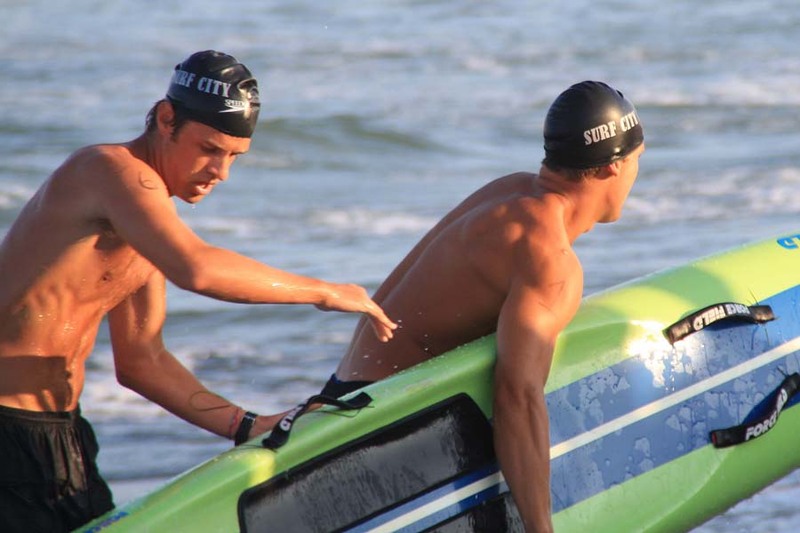 When the event finally concluded the six male Surf City competitors along with their two women team mates, Ashley Morris and Lauren Rothstein took another 1st place for Surf City. It was getting late and there wouldn’t be time for both the Open and Women’s Medley events. It was decided that the women should get a chance to compete so the Open Medley was skipped and we went right to the Women’s Medley race. 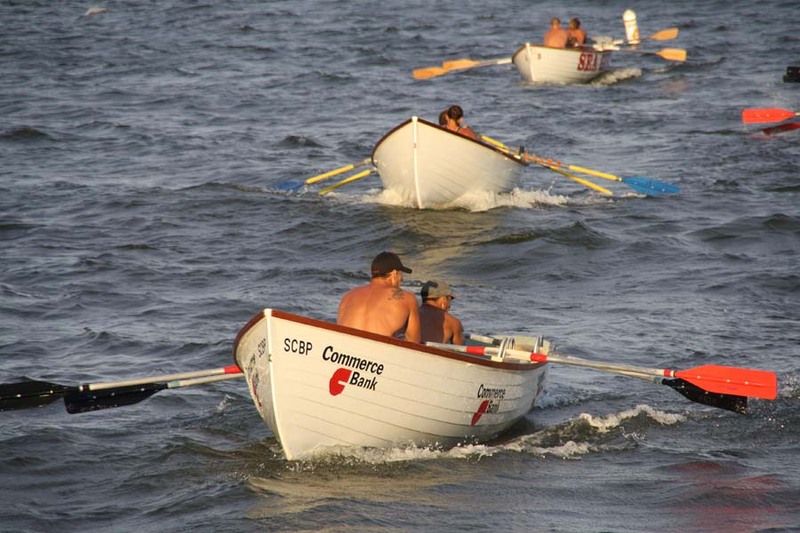 Since darkness was falling fast the event had to be shortened or else boats would be rowing on the same course, in large surf, in darkness. Definitely not a safe situation. 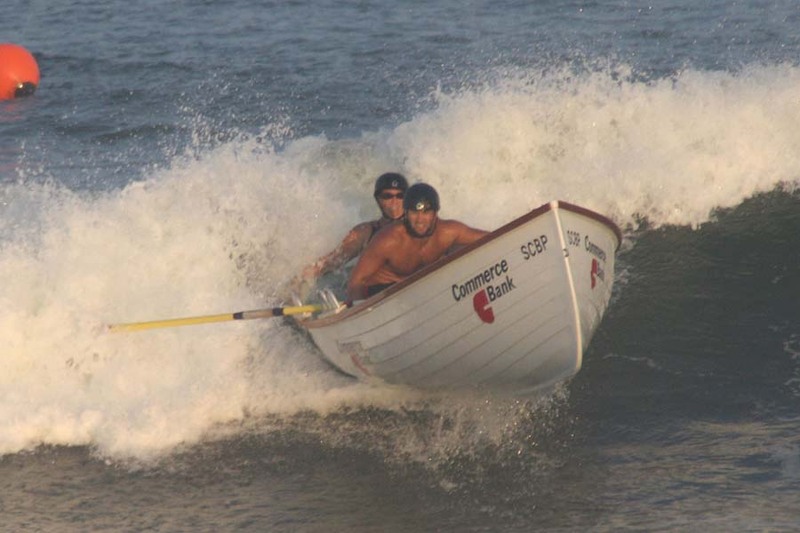 This meant the row portion of the event would have to be cancelled since the only other time saving alternative, a course change, would have meant having boards and boats in the same water. 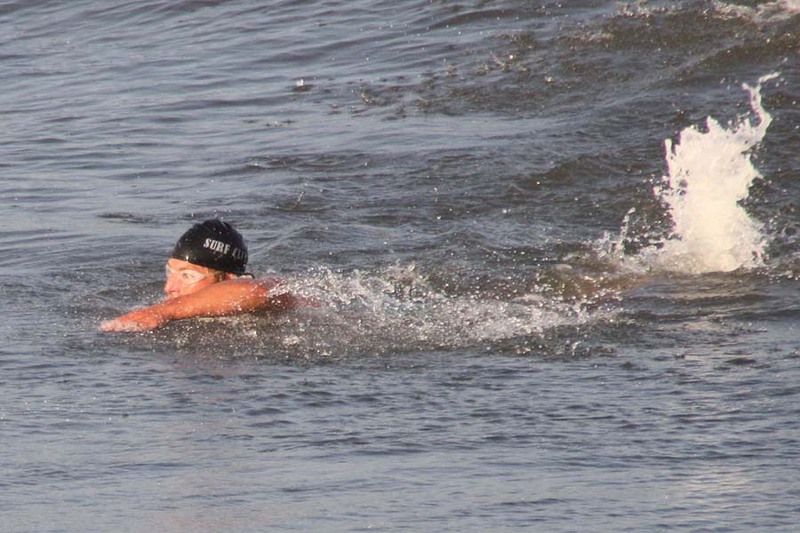 Caroline started the event with a ½ mile and got Ashley into the water in 3rd place. Ashley maintained 3rd as she tagged Lauren for the paddle portion of the event. Lauren almost bumped up the Surf City team into a higher place but in the end finished in 3rd place. Lauren takes off in the Surf Dash. When all of the points were tallied Surf City came out on top with 28 point, Barnegat Light 2nd with 14 points and Ortley in 3rd with 13 points. First year lifeguard Lauren was the first Surf City competitor of the night in the beach flags event. I have been attending this tournament on and off since 1991 and I can tell you the women in the field are fast and fierce. Lauren showed amazing poise easily out hustling the other women through the early rounds. In the semifinal and final round it was her superior top speed that allowed her to win the entire event! Nice job Lauren! In the open flags event Kyle unfortunately had a small slip off the line. In this competitive field that was enough to end his night in this event. The Iron Man Medley was next with Ryan running, Jeff swimming, Kyle paddling, and Matt and Evan rowing. Ryan had a solid run and got Jeff into the water in 4th or 5th place. Jeff swam his way to 3rd place and Kyle held onto that place as did Matt and Evan for a 3rd place finish in the IM Medley. Evan dashing to the line to finish in 3rf place in the Iron Man Medley at Seaside Park. 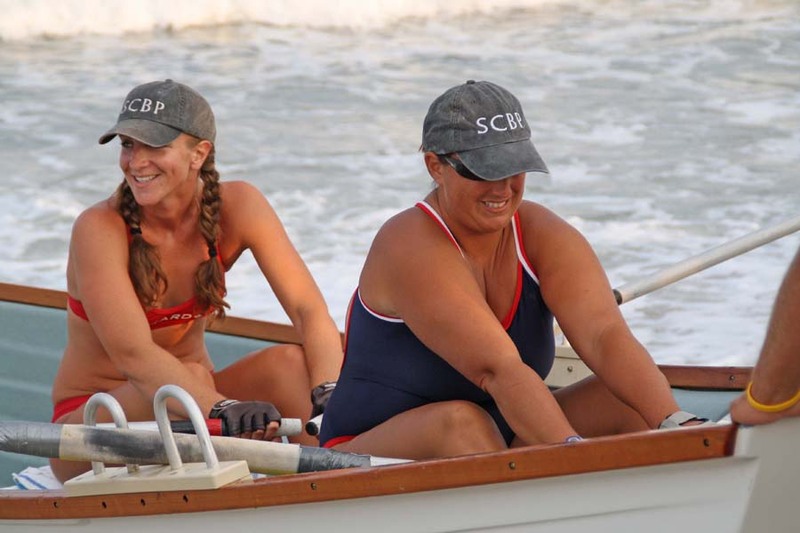 Perennial favorites in the Women’s Doubles row, Jenn and Collette handled the field in this event coming to the beach in 1st place. 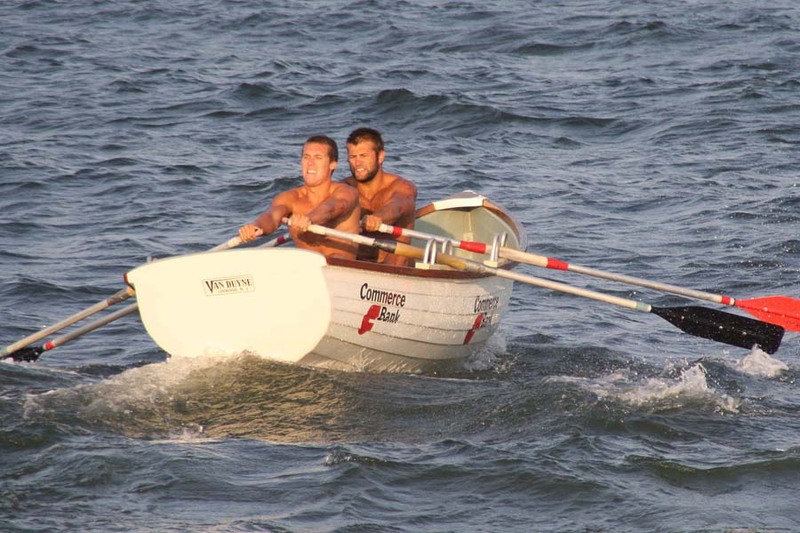 Dave and I rowed the Open Double’s which turned into a two boat race between us and Ortley. One slip getting out of the boat and we ended up in 2nd place. Ashley, Katie, and Brit would be the women’s surf dash team for Surf City and they did a great job finishing with in 5th place. 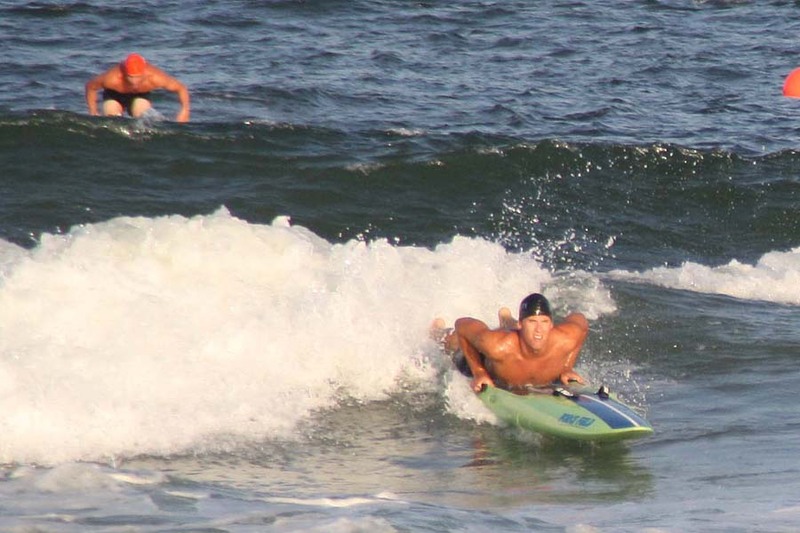 Harrison, Paul, Andre, and Jeff were the male surf dashers finishing in 3rd place behind a very strong swimmers from Lavallette and Ortley. "Oh taxi! Over here please..."
Next up was the Paddle Pick-Up. 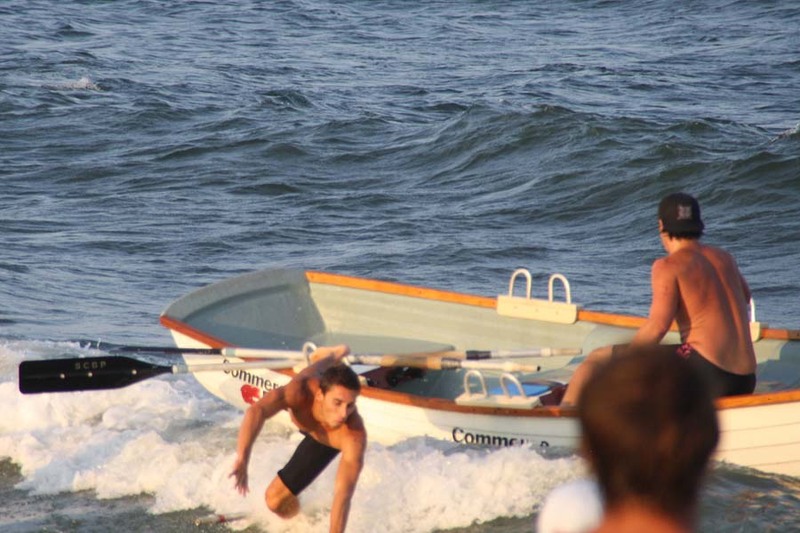 Ryan C. got out to the mark about even with the top three teams and first year lifeguard John H hopped on the board and the team took off, and off, and off, and off. 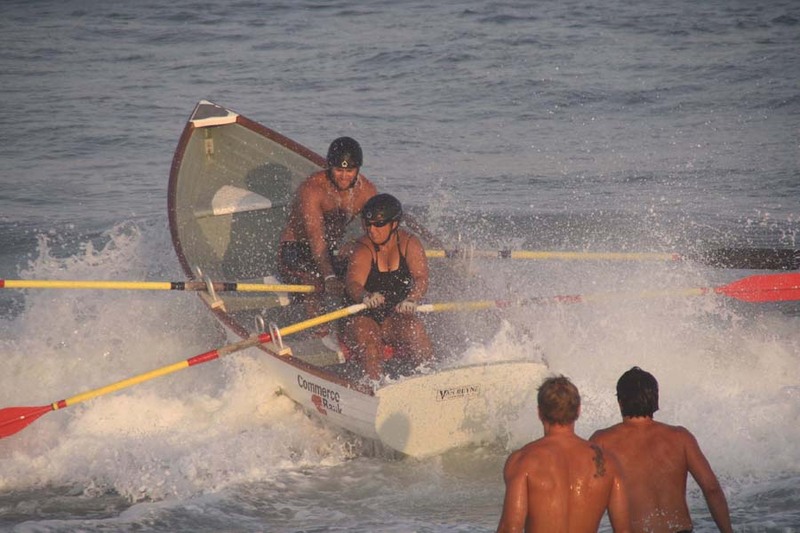 And continued to take off, pulling away from the field all the way to the beach and earning a rare 1st place finish in the Paddle Pick-Up for Surf City. Nice job guys. Ryan and John leaving the field behind in the Paddle Pick-Up. Dave and I started the boat relay and handed the boat to Matt and Evan in good position, leaving them to battle with the Ortley 2nd crew. 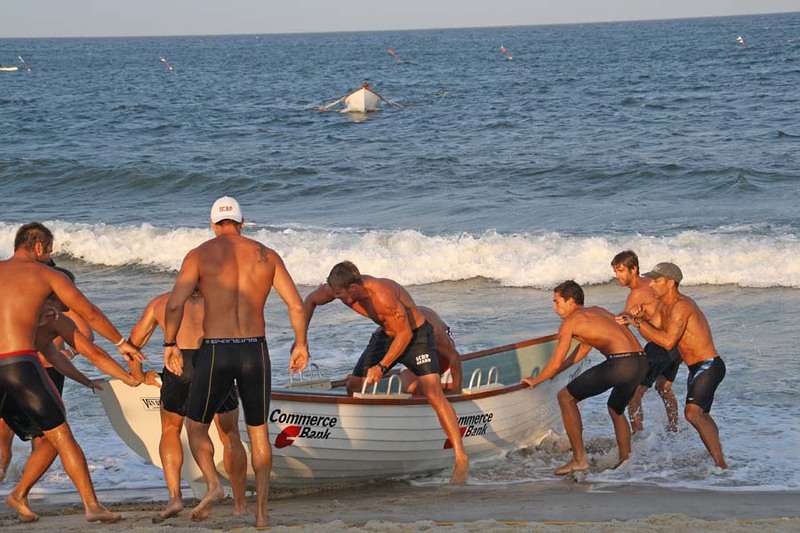 After a solid row and exchange to Jeff and Harrison Surf City ended up with a hard fought 2nd place finish in the Boat Relay. Brother team Jeff and Harrison head out for the 3rd and final leg of the always exciting Boat Relay. 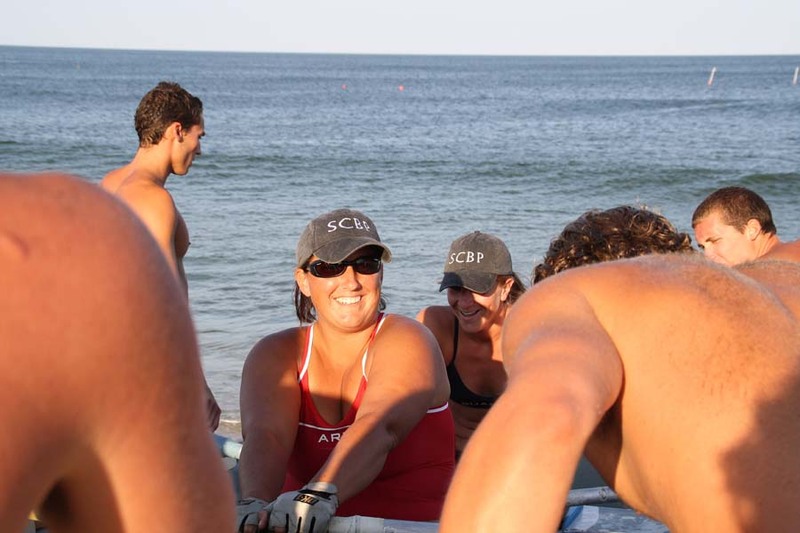 Ashley, Jenn, Lauren, and Britt completed the women’s paddle relay while Kyle, Paul, Chris, and Ryan took care of this duty for the guys. Unfortunately both teams finished out of the team points. The final event was the run relay and Lauren, Britt, Jenn, and Ashley did a nice job finishing in 4th place. The guys team, consisting of Kyle, Jeff, Harrison, and Dave decimated the field, coming in 1st place by a good 5 yards. After all the points were totaled Ortely came in 1st place with 40 points and Surf City in 2nd with 38 points. All in all a solid team performance for both the Surf City men and women. After winning the Ortley tournament in 2007, 2008, and 2009 we knew that it would be really tough to win for a 4th straight year in 2010. and after we saw the events for 2010 we knew it would be even tougher than we had expected. 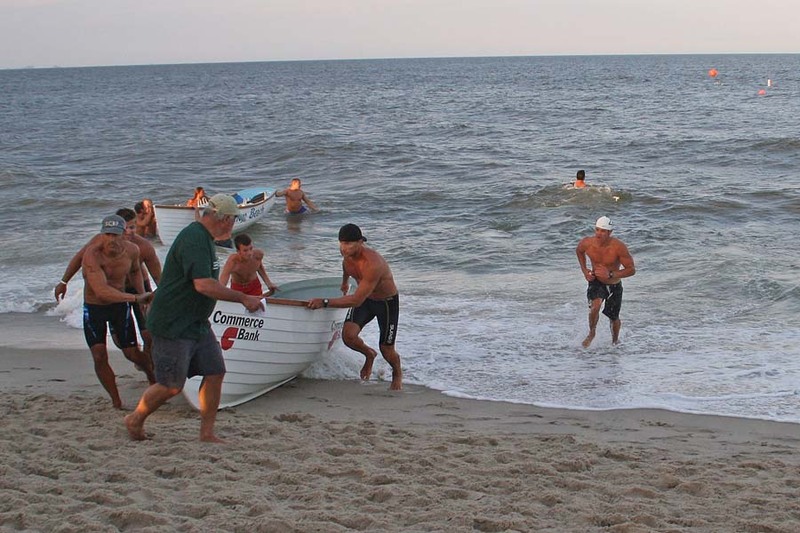 There would be no boat pick-up as there usually was in the “off” year in this tournament and the swim relay was to be replaced with an open swim in which each team would enter two swimmers to be cross country scored. A boat pick-up and swim relay would have been much better for us this year;) The wind was blowing hard out of the North so it was going to be a tough night for the rowers, paddlers, and swimmers. Dave and I came in 2nd place to the Ortley crew (again) in the 1000’ Doubles row. Jeff came out of the water in 3rd but with the other swimmers close behind in the first leg of the Iron Man Medley. 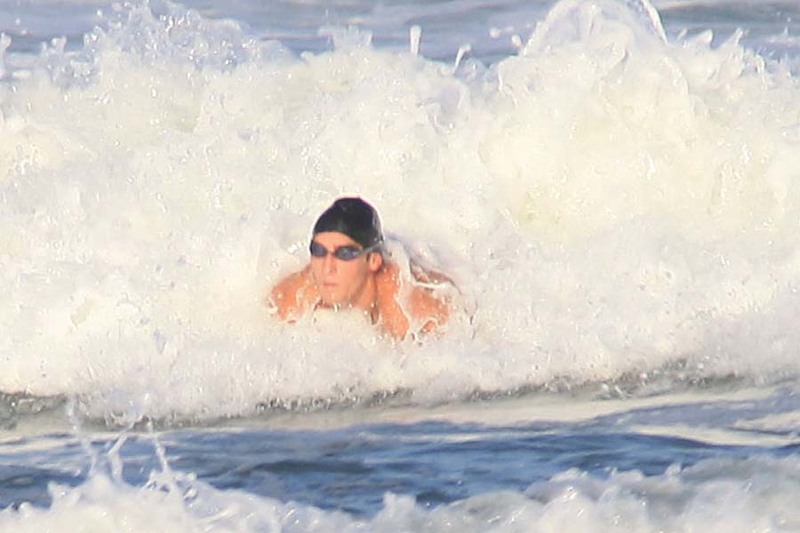 Ryan Curtin put in a solid paddle in really tough conditions and held onto that third place. Finally Matt and Evan brought it home for a 3rd place overall finish in the event. 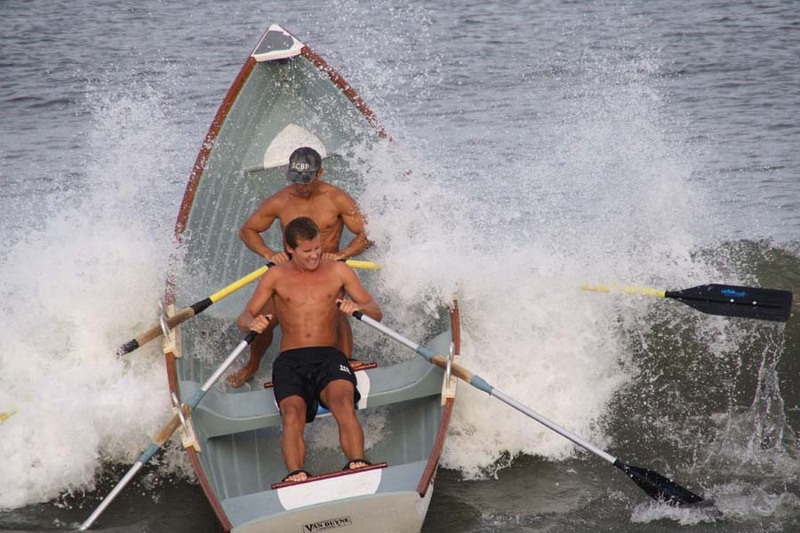 Matt and Evan head out for the row portion of the Iron Man Medley at Ortley Beach. Dave and Jeff came in 2nd in the boat swim while the paddle relay team of Kyle, Paul, Chris, and Ryan finished just out of the points in 6th place. 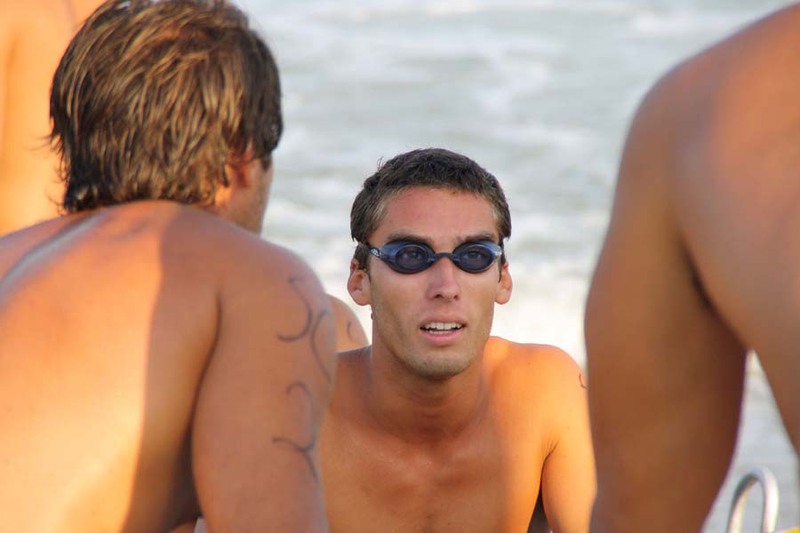 Jeff and Andre took on the open swim in a very competitive field and also came up just out of the points. 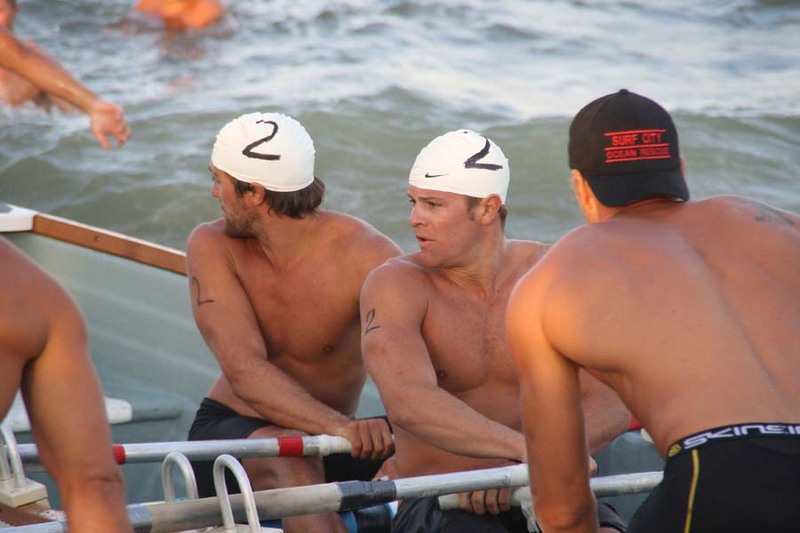 In the final event it was decided that Matt and Evan would split up and row with Harrison and Jeff, respectively. Kyle and Nick would be the last leg of the 8 person boat relay. After it was all said and done we finished in 4th place in the boat relay. Well, it definitely wasn’t a tournament suited to our strength, that is the depth of a 12 person team, but Ortley as usual put on a great show with an expertly run tournament. The final result was a 4th place team finish for Surf City out of 10 competing teams. Not bad considering 3 of the 5 events were swimming events and distance swimming isn’t really our strong suit this year. The last time we competed in the Sandy Hook tournament was 2008. 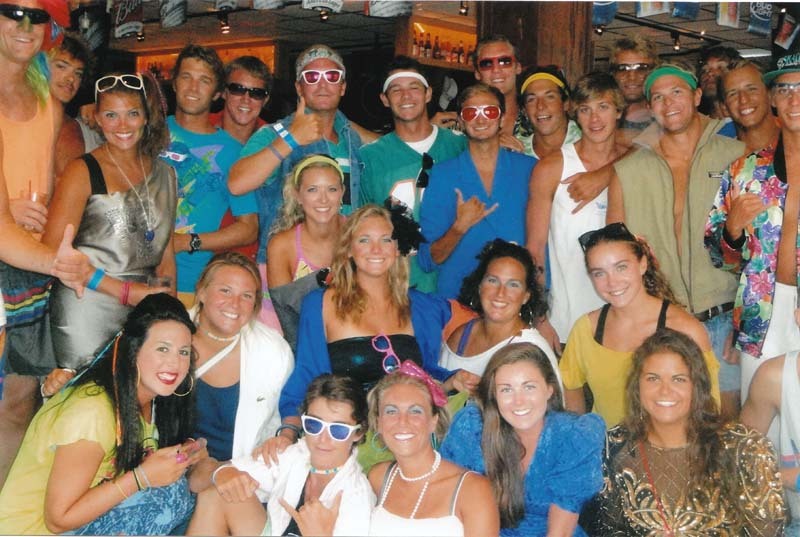 In 2009 the event was cancelled due to rain and rescheduled on the night of our lifeguard banquet. 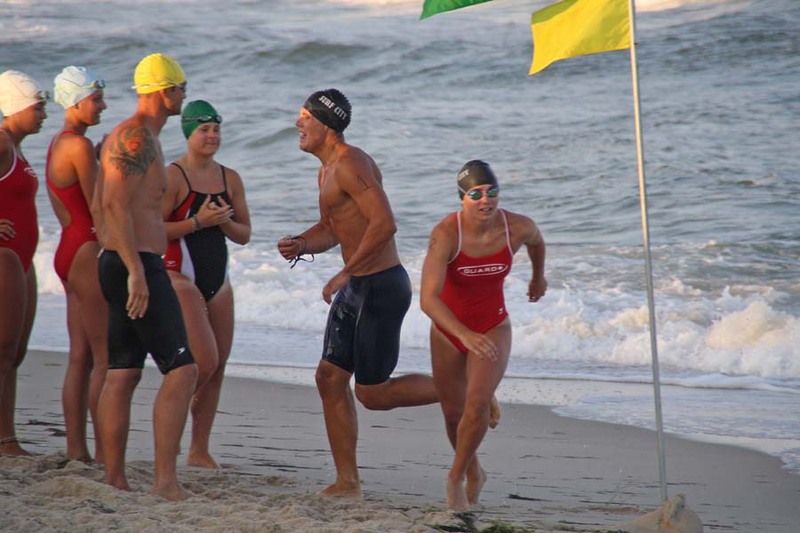 Jeff would get a good chance to practice for the Island Iron Man in the Sandy Hook Iron Man, which has a shorter swim but a longer row than our LBI event. 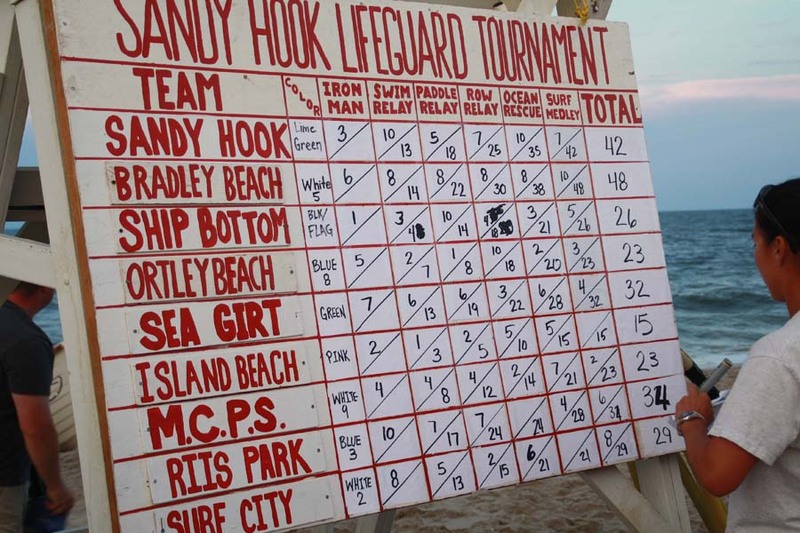 There were 9 teams at Sandy Hook this year so there would be even more crowding of boards, boats, and bodies this year because of the common course nature of the tournament. Jeff had a good swim in a very tough field of swimmers getting out of the water in about 5th place. 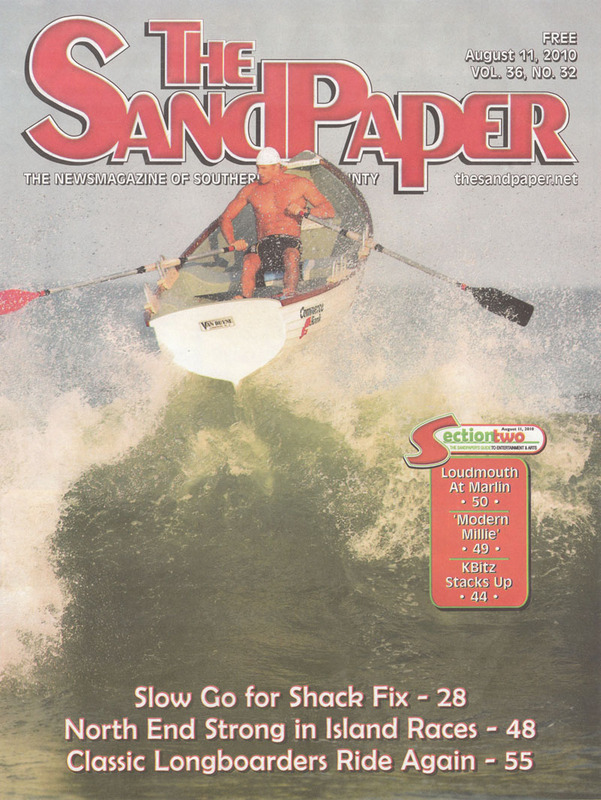 He did about the same in the paddle and entered the boat in 5th place. 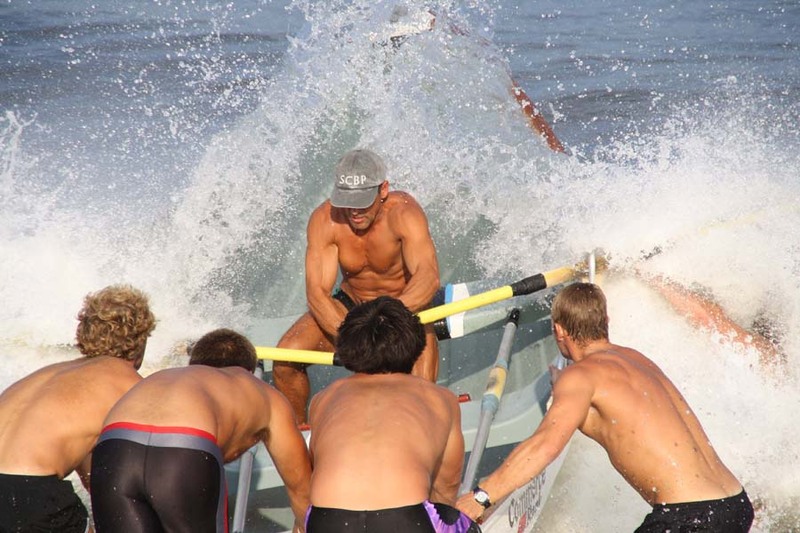 It was blowing hard out of the South and a very tough row for tired iron men rowing singles. 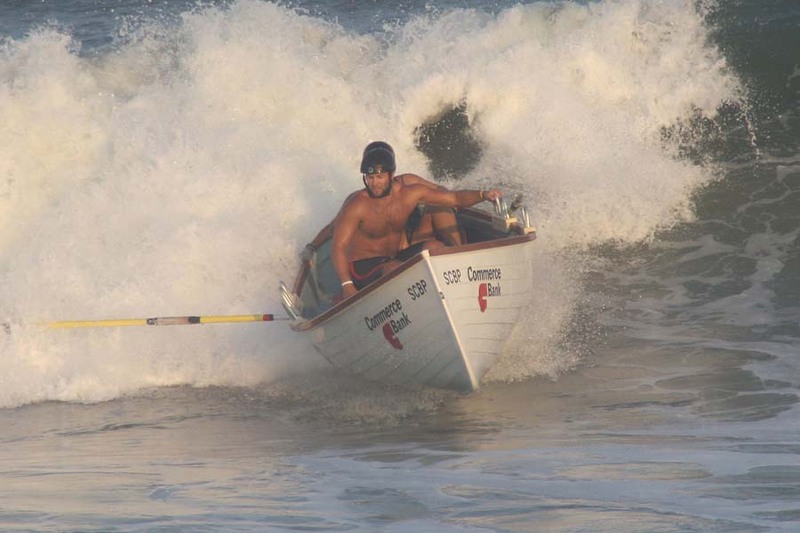 Jeff stayed with it and rowed a good line with only two minor collision and hit the beach in 2nd place. That was one tough iron man! Harrison, Andre, and Derek would be the swim relay team and they finished up in 5th place. Derek had an exciting battle with the swimmer from Monmouth Country Parks after reeling him in during the swim in the end just got edged to the line. Kyle, Harrison, and Ryan were the paddle relay team and they finished the event in 7th place. Not a bad finish considering Harrison had to fill in at the last minute and had just competed in the swim relay and has very little experience on the 10’6” board, especially in conditions as tough as these. 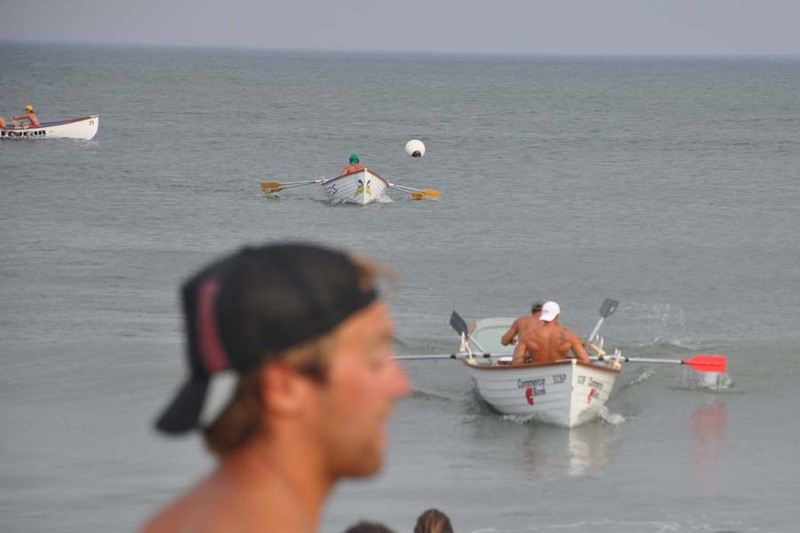 The Row Relay was next and unfortunately Surf City was in the North-most lane. The worst lane if the wind is blowing strong South on a common course row. 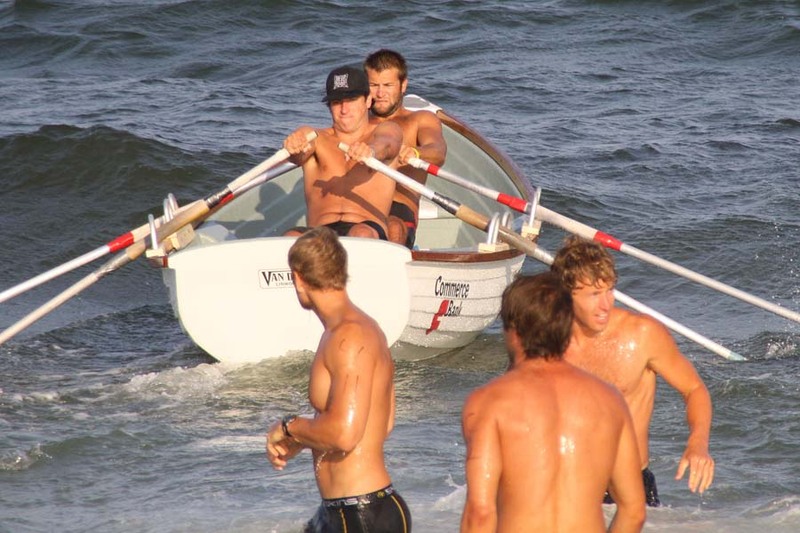 The boat that gets to the 1st buoy first controls the race. In addition the race was started before the teams on the South end were even ready so we got off a second or so behind the teams on the North. We were able to fight our way to 3rd place before handing the boat to Matt and Evan. 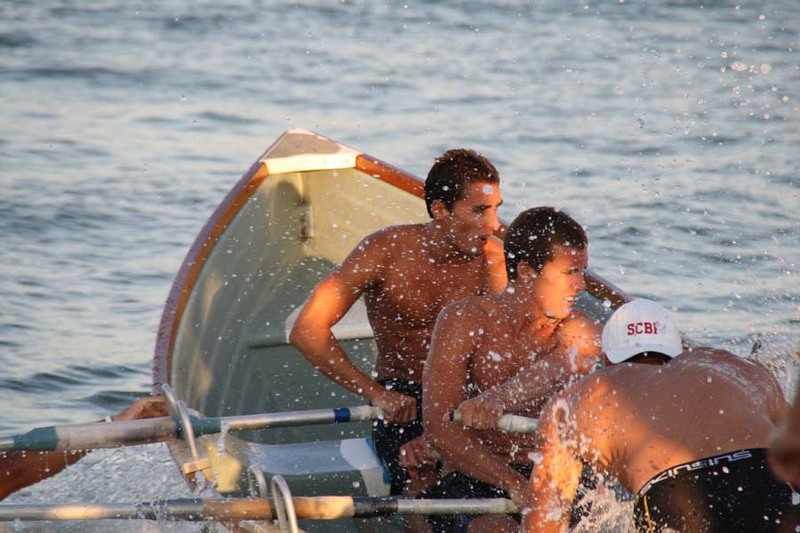 They had a great row and handed the boat to Kyle and Nick in 2nd place. Kyle and Nick held 2nd place for most of the row but got hung up with some boats at the 2nd buoy and got the worst of the “break up” of boats finishing the row relay in 4th place. In the line race Andre would swim the line, Jeff would be the buoy swimmer, and Derek the victim with Evan and Matt pulling. Unfortunately there were two teams (!!!) with white caps so we started Matt and Evan pulling before Jeff raised his hand to signal the start of the pull. Of course we were disqualified in this event. That's a mistake we haven't' made in years (Island Beach 2008 actually) and it really hurt our overall place in the tournament. Oh well, live and learn right? In the final event, the Iron Man Medley, Sean got his first chance to swim in a lifeguard tournament. 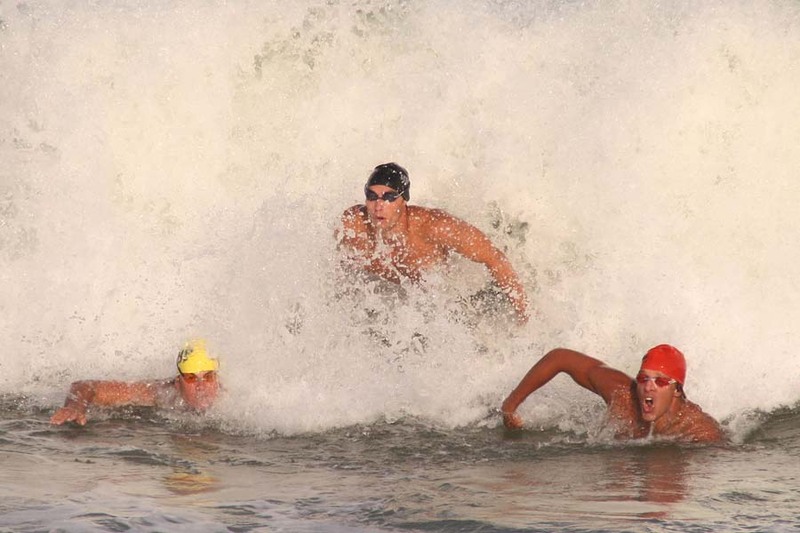 It was another tough field of swimmers with Sean coming out of the water in 6th place in a tight grouping. Kyle held that place through the paddle portion of the event. 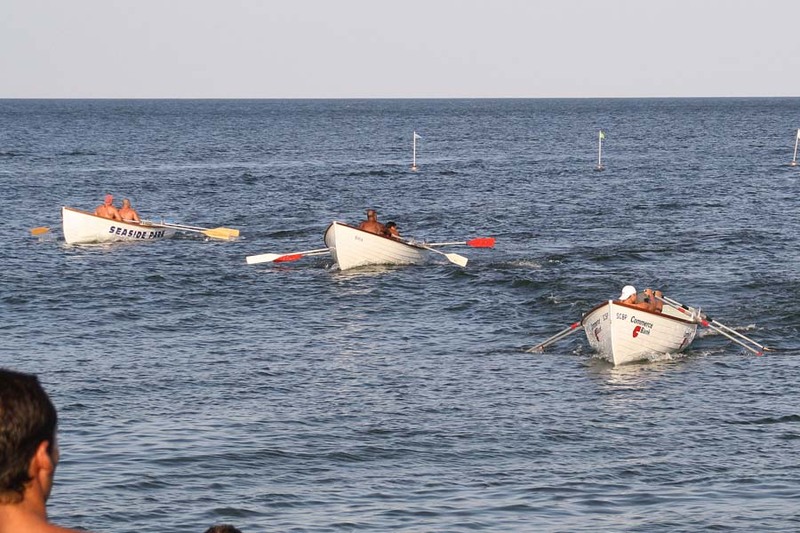 Dave were able to weave a good course though the boats enabling us to pass 4 boats in the row portion of the event for a 2nd place finish in the Iron Man Medley. That was one of the most satisfying rows of the season for us! 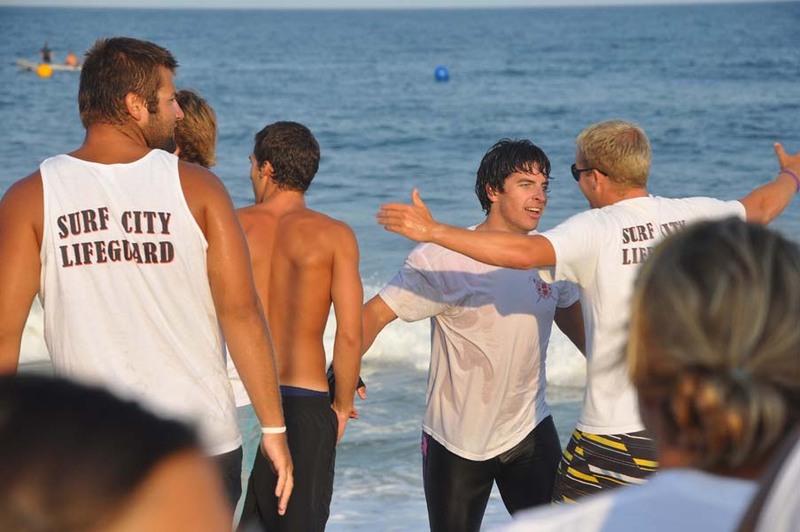 When the points were tallied Surf City came in 5th place overall in the 2010 Sandy Hook Lifeguard Tournament. 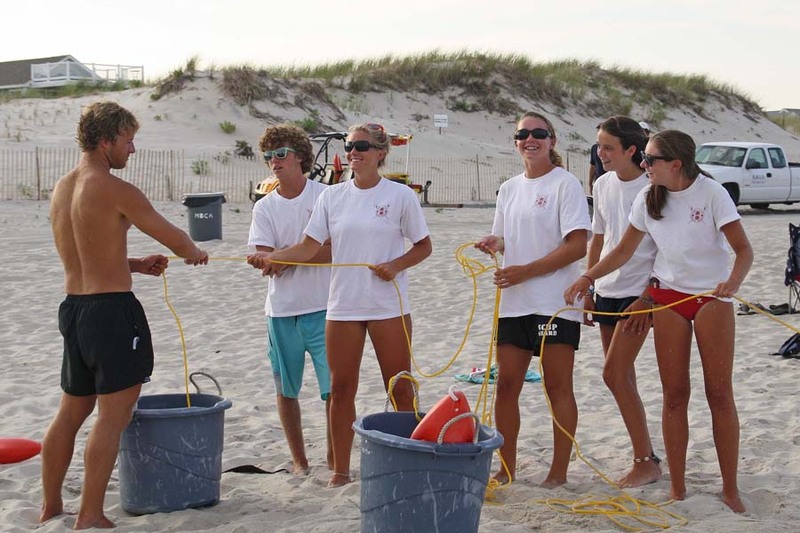 The Midway Beach Tournament is a good opportunity to practice for the Island races and to get our new competitors involved in a lifeguard tournament. Chris Holloway started out the paddle relay, followed by Nick L., Matt G., and Brian D. They put in a solid performance with a 5th place finish. Harrison and I were up next in the boat rescue. We figured this would be a good chance to practice for our race the following night. Good thing we did! I rowed a terrible zigzag course to the buoy, overshot the turn, and then we had a heck of a time getting our oars together on the way in. I don’t know what place we came in but I think it was 2nd from last. 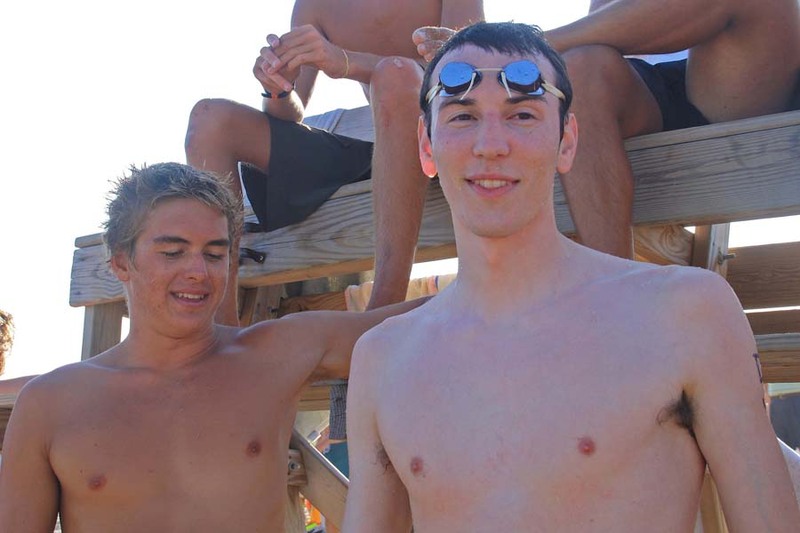 Sean M. swam out the line in freezing cold water in the next event, which has been substituted for the swim relay at last year's tournament. Unfortunately we didn’t attend the Midway tournament last year so I didn’t know this and we put a line team together in short order. 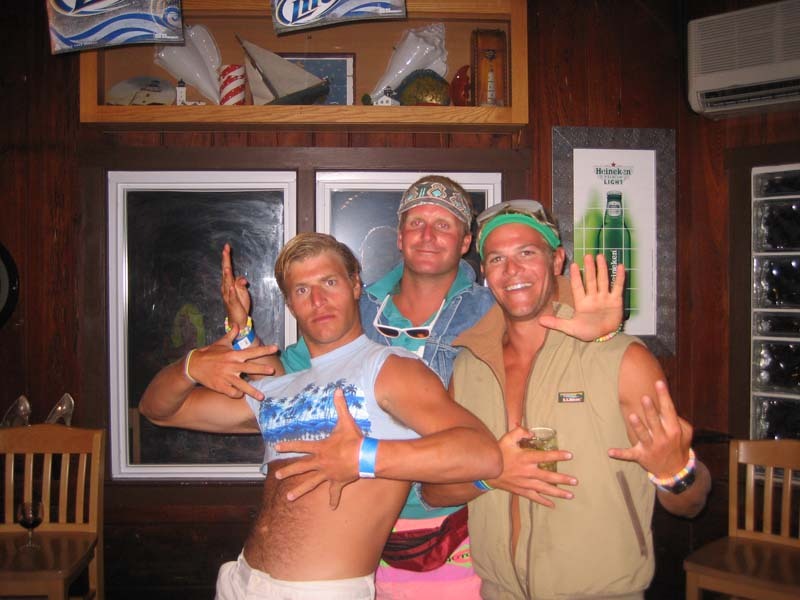 Matt Kaminskas and Nick Labita would be the pullers. 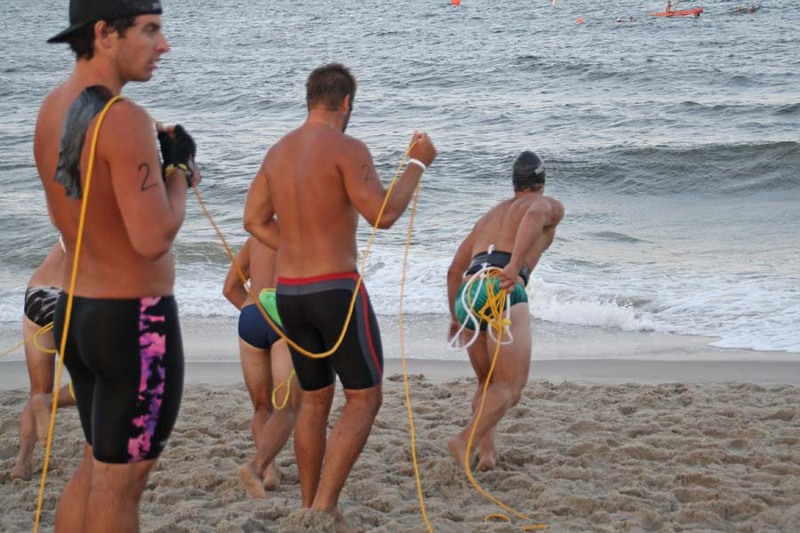 Sean was first to the buoy and to the beach but somehow we were awarded with a 2nd place finish? 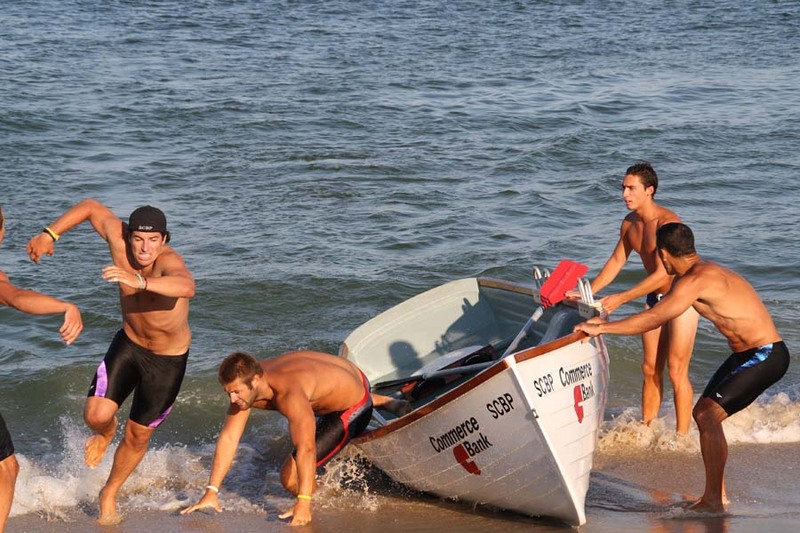 Matt and Evan started out the boat relay and handed the boat over to Jeff and Nick in second place. I don’t remember what place they came in but after the final leg I rowed with Harrison we ended up in 4th place in this event. 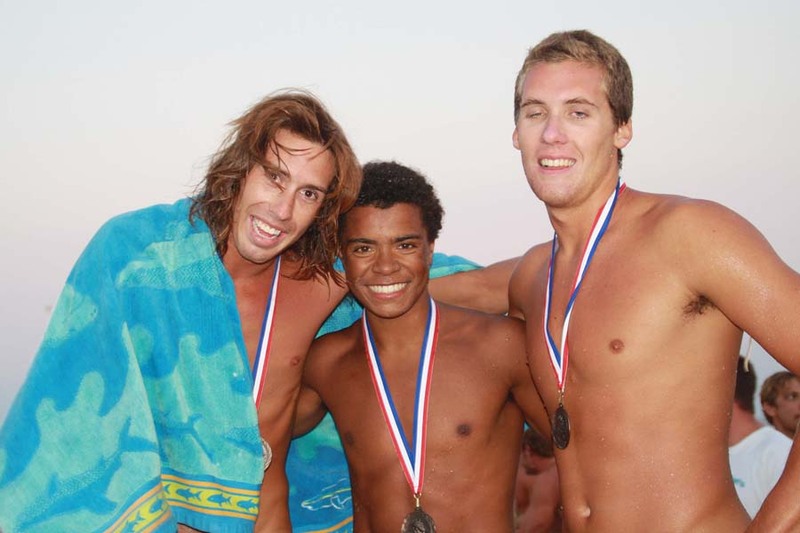 The Garner brothers took on the Row Out/Swim In and Andre hit the beach in 3rd place. Nice job boys. In the final event, the Run Relay, the runners were Jeff, Harrison, Nick, Chris, Brian D., and Matt G. Unfortunately, while we were in the lead the buoy was dropped and we ended up out of the points in this one. 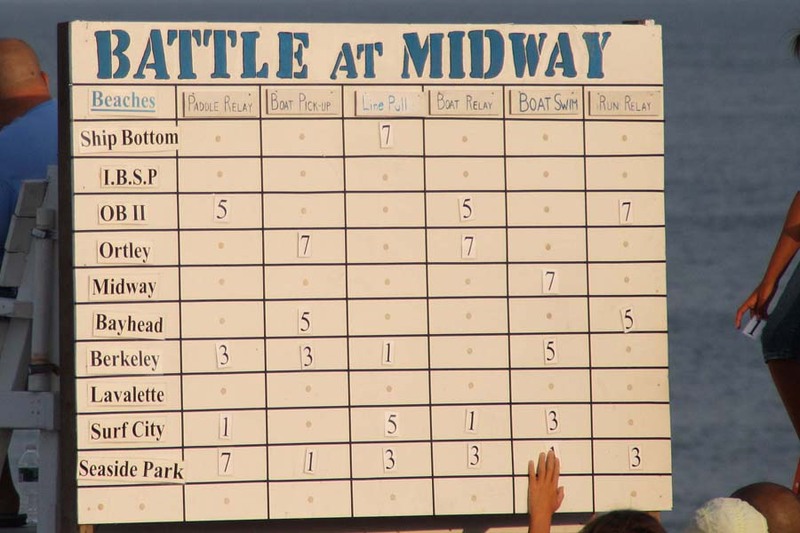 When all of the points were tallied Surf City ended up in 5th in the 2010 Midway Beach Tournament. 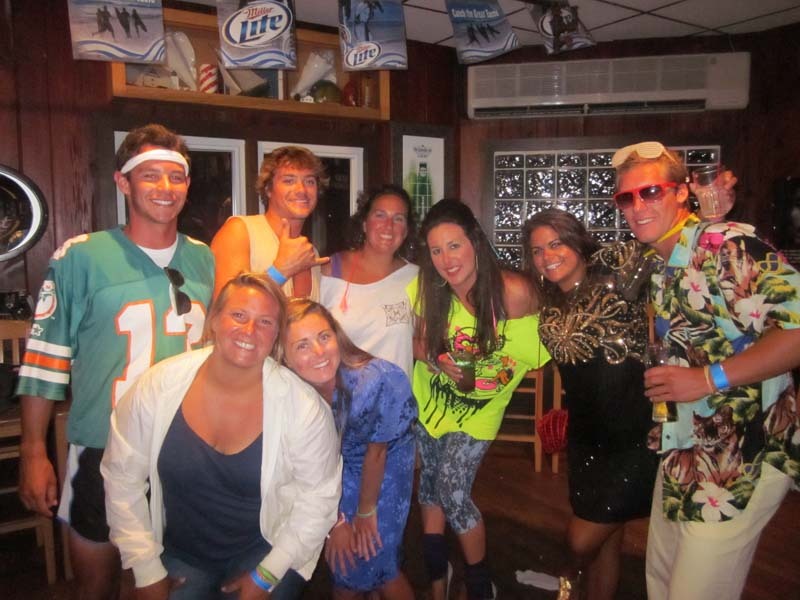 Like the Epic, it seems our Island tournament can never go off without some strange circumstance. Big waves, 30knot winds, cold water.. or some other problem. This year it was 58 degree water. 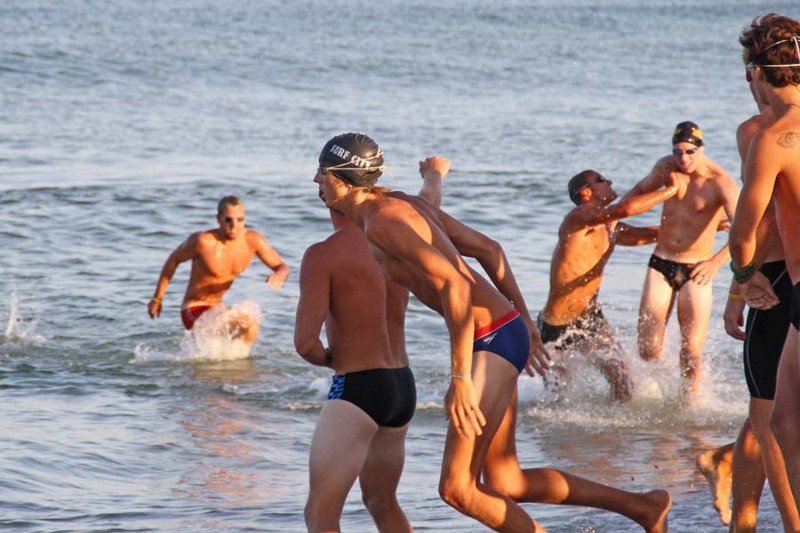 The tournament went off as scheduled as you might imagine most competitors were wearing wetsuits for the swimming events. 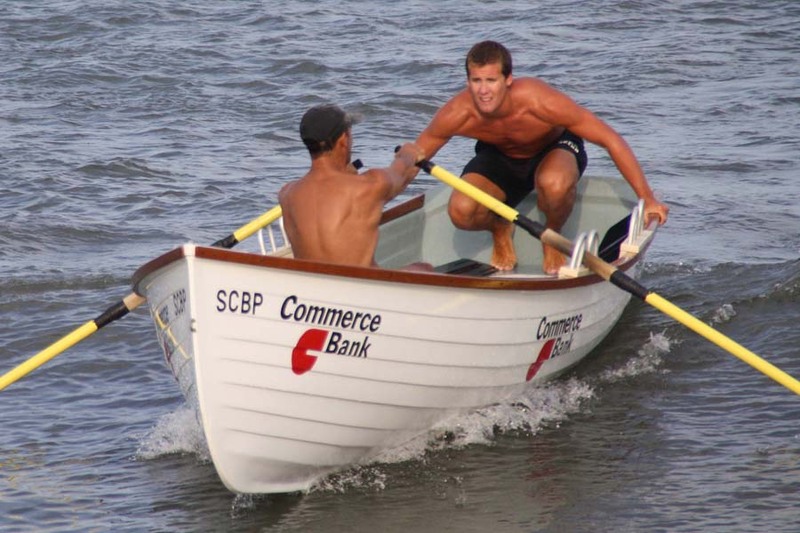 Dave and I rowed the Mile Row in hopes of duplicating our 2002 victory in this event 8 years ago. We got a fantastic launch from Matt and Evan and were off. We caught Harvey Cedars literally a minute or two into the race and passed them and LBT coming out of the first mile buoy. 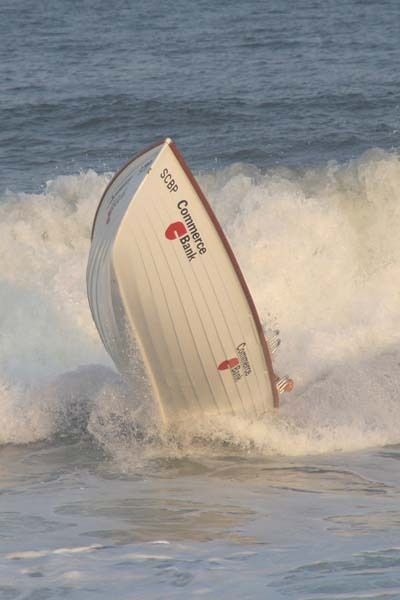 Unfortunately the always strong team from BL was washed out on the launch and had to return to shore and dump the boat and re-launch, effectively taking them out of contention to win the race. So now with Ship Bottom behind and only Beach Haven ahead of us, but technically behind because of the staggered start, the race looked to be ours to win or lose. 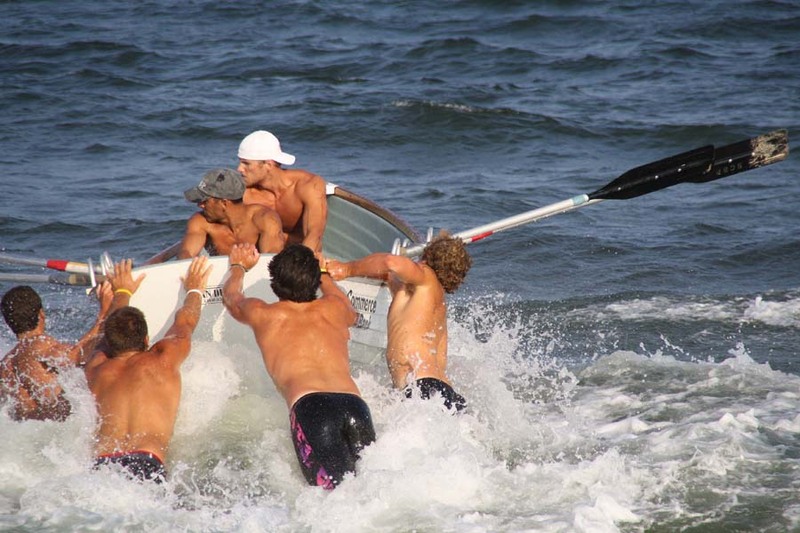 We pushed on and eventually passed the Beach Haven boat for a Surf City win in the first event of the 2010 tournament. I give a lot of credit to the BL crew for getting back out there and managing to still finish 4th. I didn’t see Lauren paddle but I know she did a great job and was leading the race through the halfway point but got the wrong end of a wave and ended up in 5th place. I know how strong and experienced that field of women paddlers always is so to be in to win it for that long is a huge acheivement. 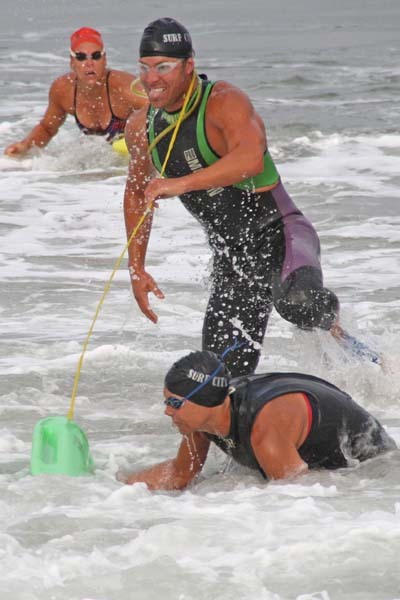 The Buoy Rescue team of Andre and Ashley returned to this event after a 5 year hiatus and brought home a solid 2nd place finish. The Paddle Relay was up next with Kyle having a great first leg, catching a wave and handing off the board to Paul in 1st place. 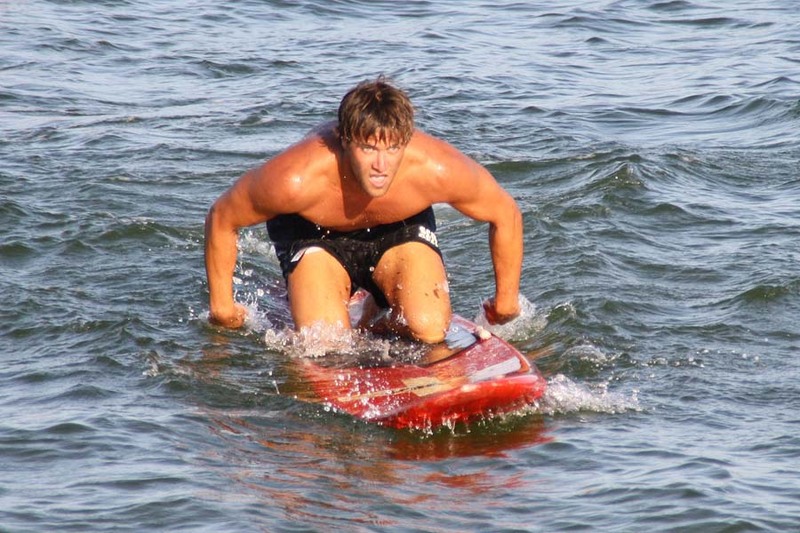 Paul also had a good paddle and even got up on his knees for a bit to hold onto 1st place for Surf City. Chris Holloway was up next and in this leg our lane didn’t do us any favors as the other lanes seemed to get better waves so we slipped back to 4th place which is where Ryan Curtin finished up the race. Jenn and Collette were up next in the Woman’s Doubles Row and as always were the first boat coming of the buoy, or perhaps tied with BL. But 30 seconds after that they were definitely in first. There was flat water in Jenn and Collette’s lane and a nice runner in BL’s lane so BL came in first with Surf City taking 2nd in the event. Unfortunately after the medals were awarded it was decided by the judges that Surf City didn’t come in 2nd but 3rd and they had to return their medals! I protested the decision but to no avail. But for the record the women did come in 2nd in that event. Harrison and I were up next in the Boat Pick Up. While on the starting line Harrison’s wetsuit split open and had to be duct taped together! Despite the last minute craziness Harrison had a great swim reaching the buoy in 2nd place. 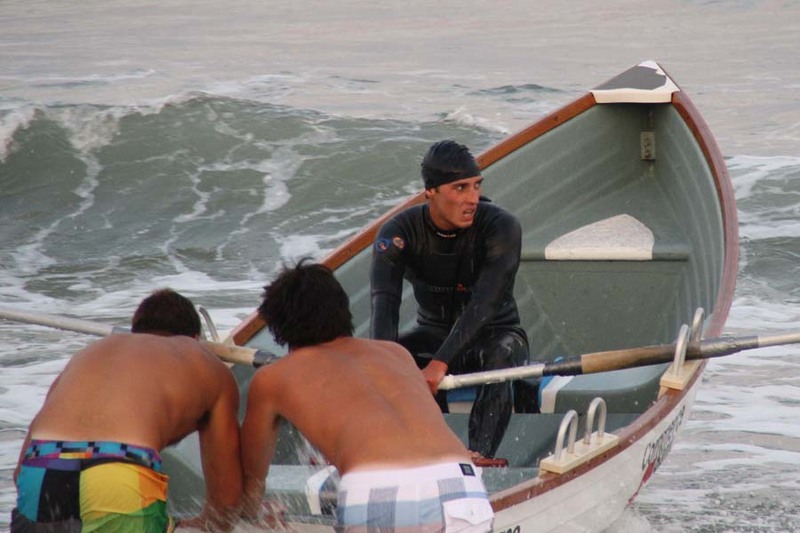 Unfortunately I got hammered by 4 or 5 waves on the way out and there was no recovering so we finished in 5th place. Next up was Jeff in the Iron Man. Since he didn’t have time to practice getting on and off my full wetsuit it was decided he’d do the whole race with the suit on. In hindsight that was a mistake. While he did get out of the swim first; having to run, paddle, and row in the suit was a huge drain on him and he finished in a very uncharacteristic 4th place. 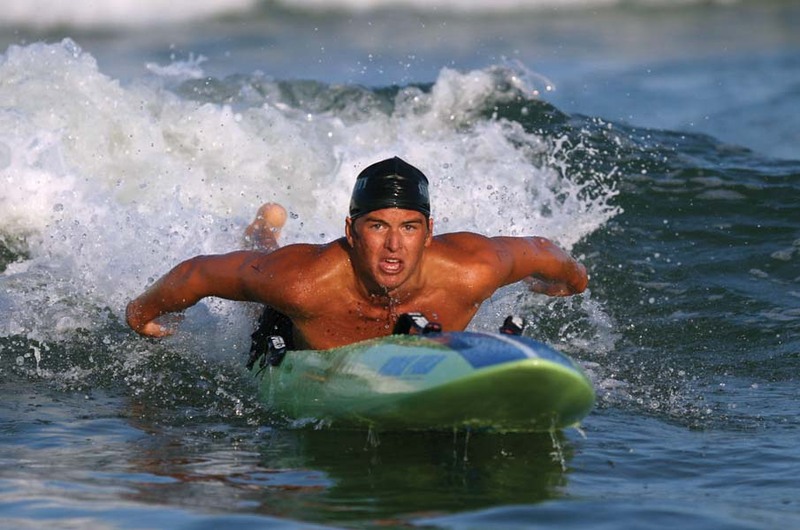 That is one event I’d like to see again without wetsuits. 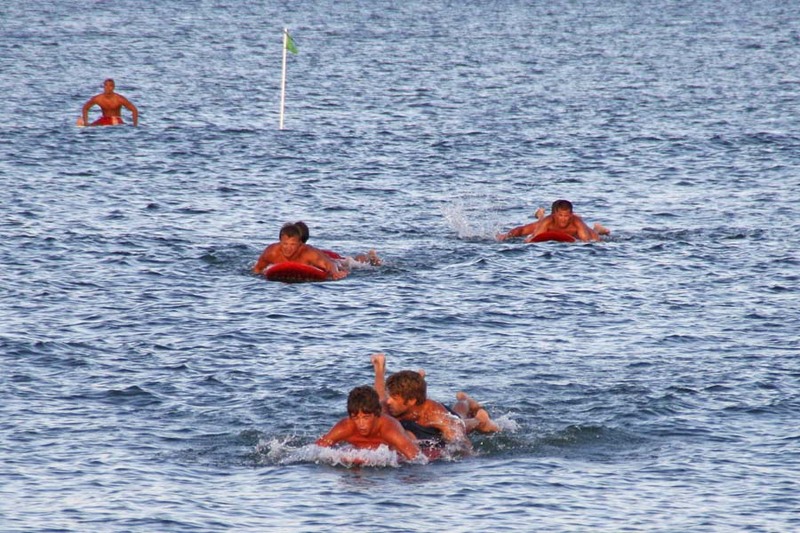 The second night of the tournament brought warmer water and much larger waves. 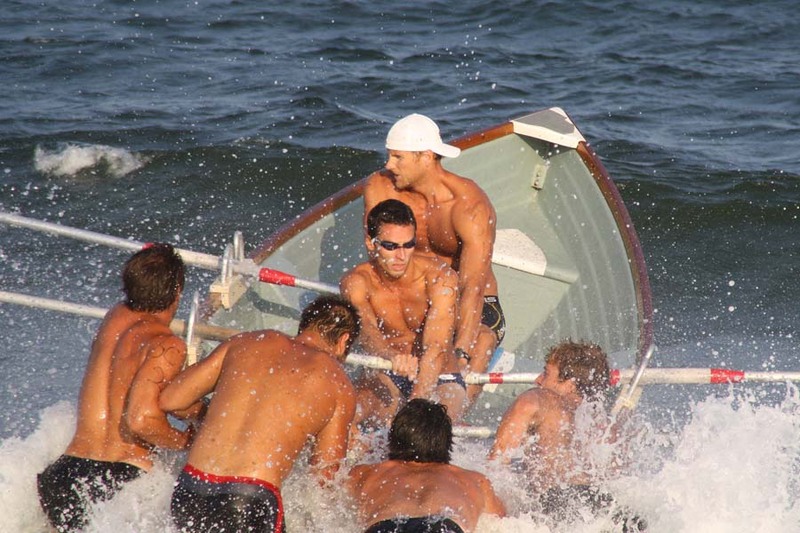 The outcome of the rowing races was highly dependent not only on the skill of the rowers but also on the wave set in a particular lane. 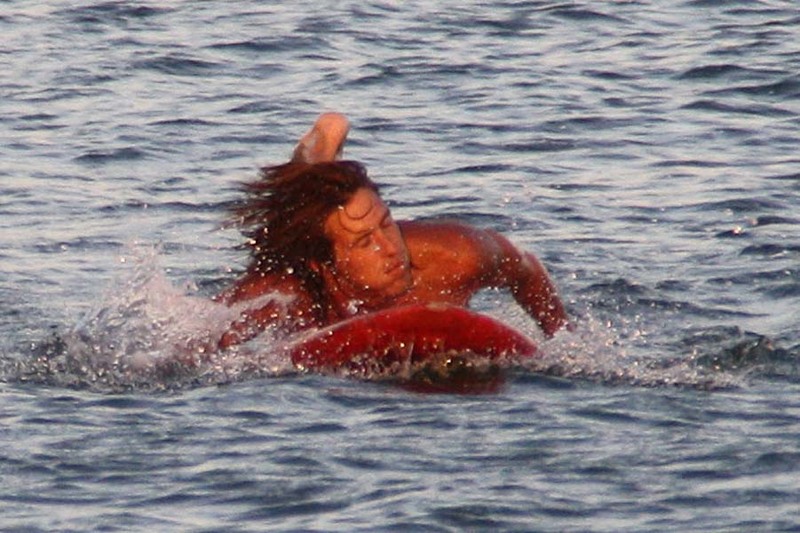 Matt and Evan had one of the tougher lanes and caught quite a few waves on the way out and flat water on the way back. Despite that fact they still managed to power their way to a 3rd place finish. 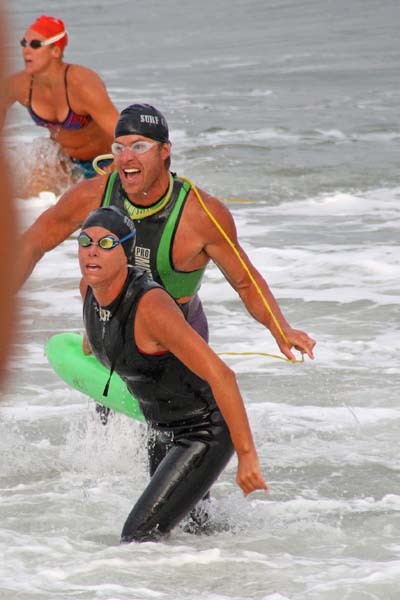 Ashley just missed 3rd place in the Woman’s swim while Jeff hustled out of the water to claim 2nd place in a very competitive Open swim field. 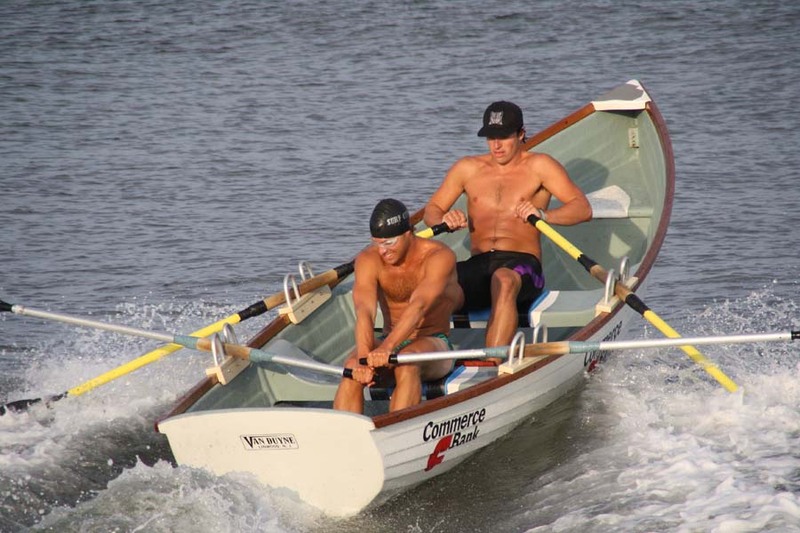 John Holloway and Ryan Curtin came in 3rd in the Paddle Pick-Up while Andre, Conner, and Evan got ready for the Line Race. 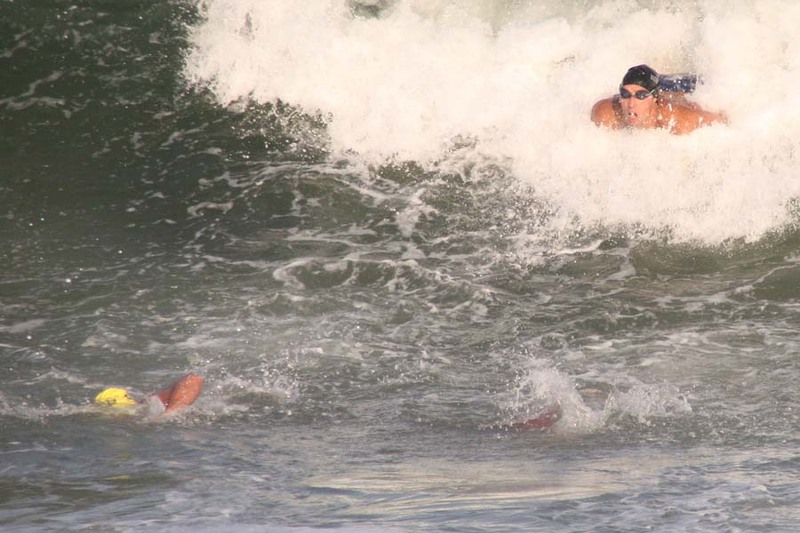 It was pretty ironic actually that the calmest wave set of the night was during the swim out of the line race when a big set would have made the event more fun and no more dangerous. Of course Andre would have preferred a big set during his swim but c'est la vie. 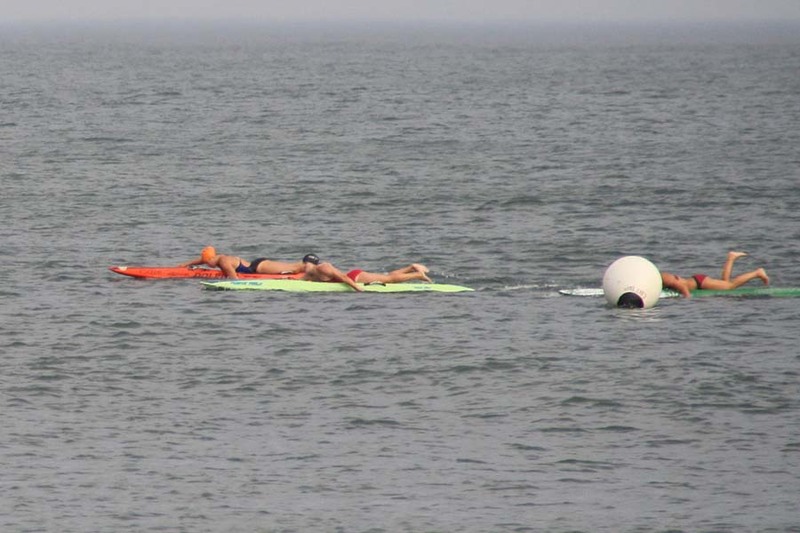 Despite the fact that it was nearly a flat swim Andre was still first to the buoy by about 4 or 5 seconds. You just can't stop this guy in a line swim. 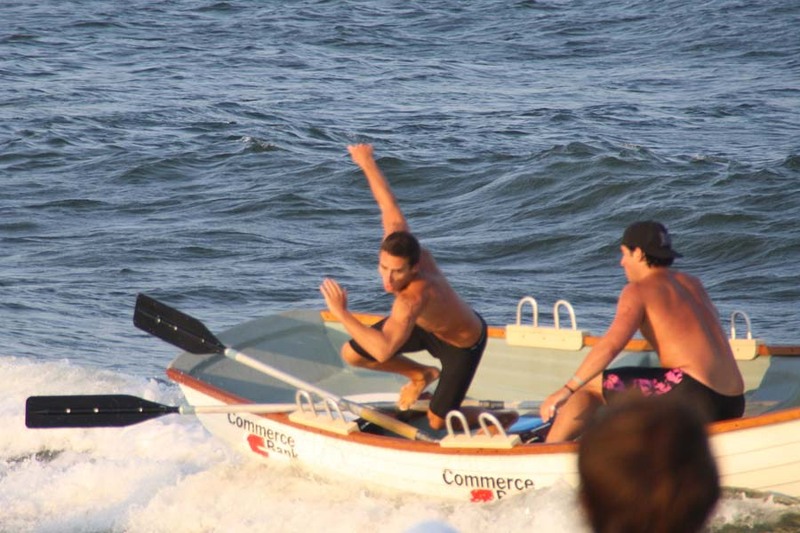 And that as they say, was that as Conner and Evan took their pulling lead and made sure it turned into a 1st place finish for Surf City. That's how you feed the line! All in. A little wave to seal the deal. 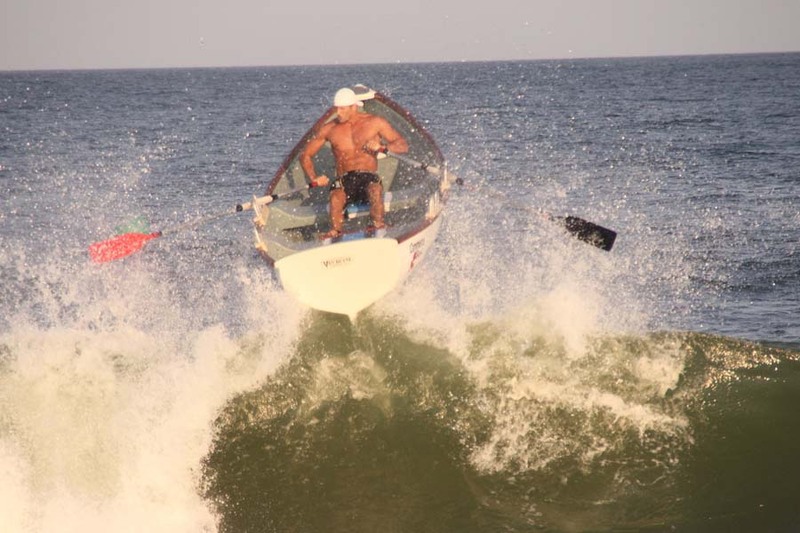 Dave Bonanni was up next in the Singles Row and despite a tough set on the way out opened up a sizeable lead as the boats approached the beach and ended up walking away with the gold medal yet again in this event. I'd like to explain exactly why I contested the finish of this race. 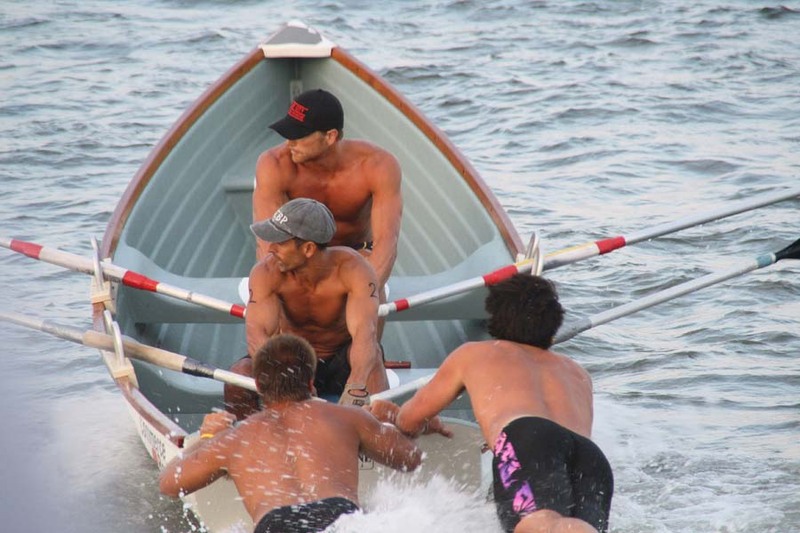 Although you are supposed to land your boat in your lane every rower knows that can be extremely difficult for inexperienced (an even experienced rowers on occasion) rowers. 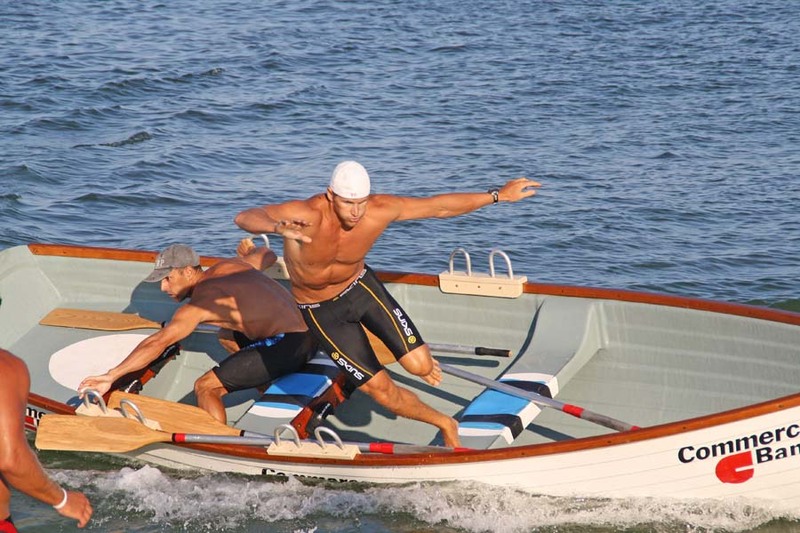 Because of this fact boats are not disqualified or penalized for not landing in their lane UNLESS they blatantly interfere with another boat. 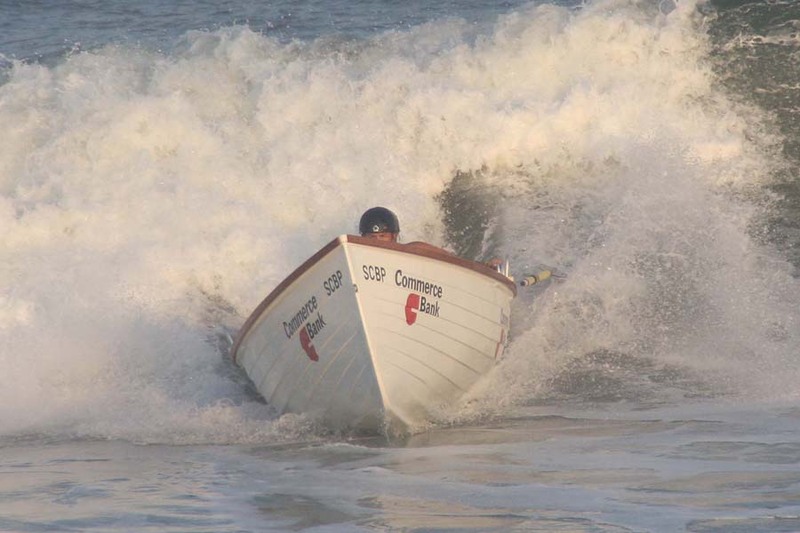 Dave brought the Surf City boat directly into our lane in 1st place while a few seconds later the Harvey Cedars boat peeled into our lane IN FRONT of our boat. Gunnel to gunnel. 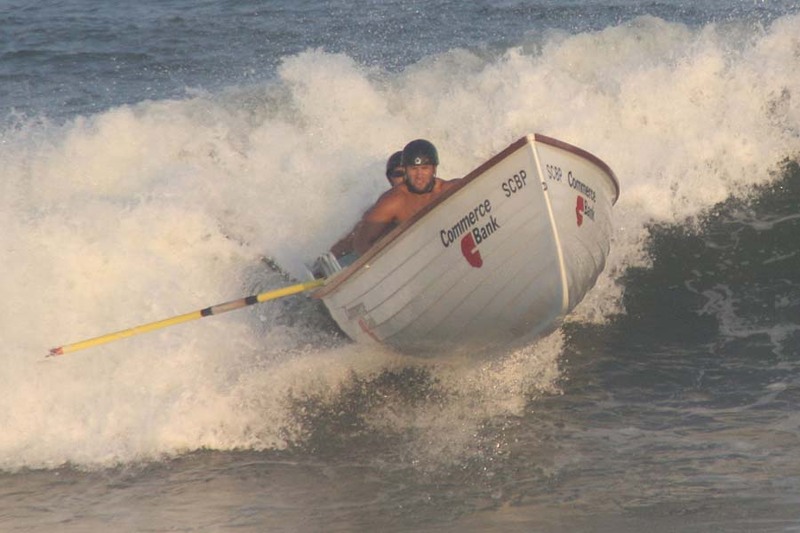 There was no way for Dave to exit the boat until the Cedars boat was moved out of the way. Put simply Dave was first to the beach but unable to exit the boat due to the Cedars boat interfering with his exit. 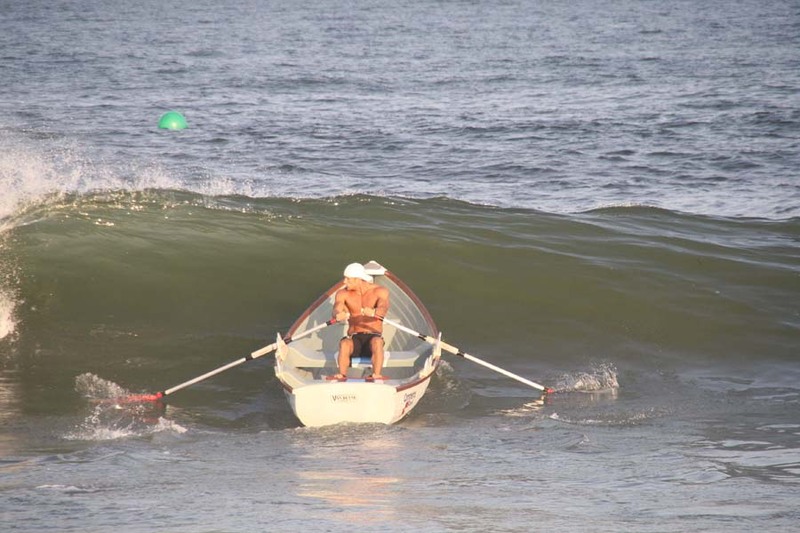 Matt and Collette hooked onto a BOMB 10 strokes off the buoy…they both got to the back of the boat and rode this wave to the beach with a ferocity I have never seen in my 27 years watching lifeguard races. It was truly a thing to behold. Unfortunately the boat turned 15 feet from the beach forcing a bit of a swim to the beach and a 3rd place finish. Look at the photo to the right. Only the last foot or so of the boat is in the water! As usual the 1500’ Paddle race came down to a wave to the beach and Kyle just missed the wave most of the other competitors caught and ended up in 5th place. 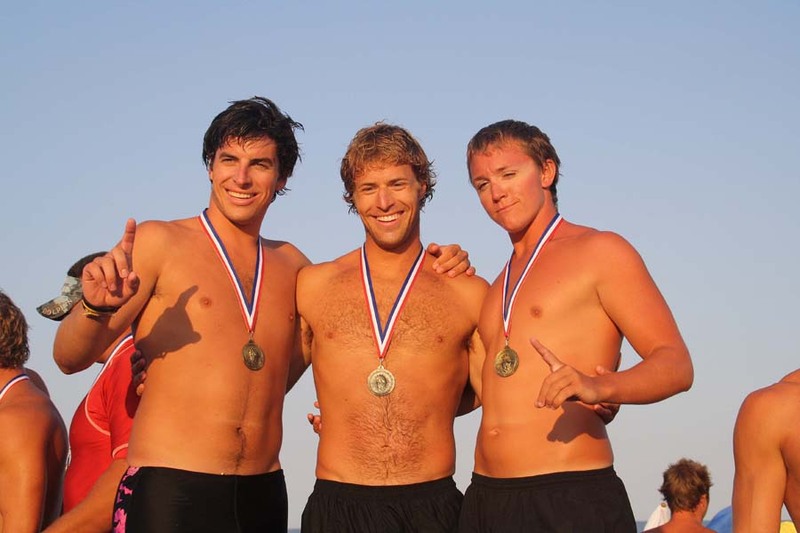 Derek, Paul, and Harrison would compete for Surf City in the final event of the 2010 LBIBPA Tournament, the Surf Dash. It was a physical event as Harrison's scratch marks tell the tale! When it was all said and done it was another 3rd place finish for Surf City. A very good result considering illness and injury setbacks we had this summer. 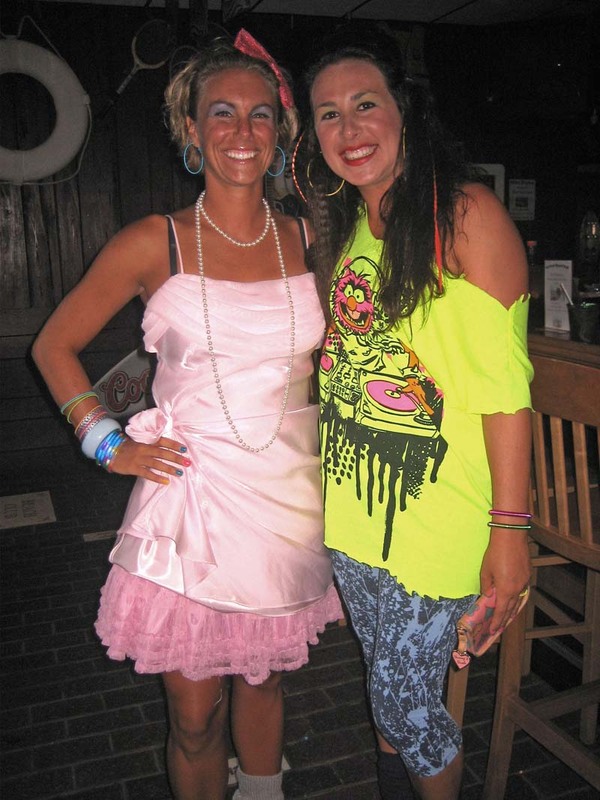 The theme for the banquet this year was the 1980's. I'll let the pictures speak for themselves! 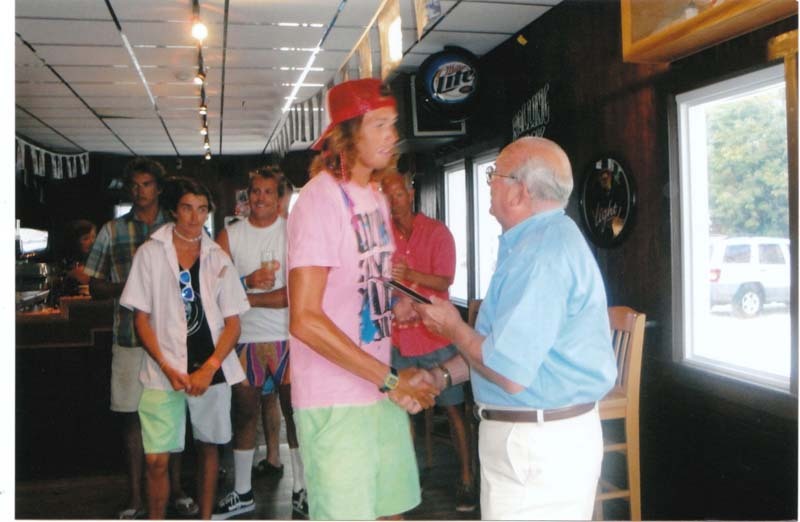 On a serious note Paul receives his commendation from the Surf City EMS Squad for performing CPR on his beach. That's all! See you next summer.